Prievidza..last 2 day’s ! 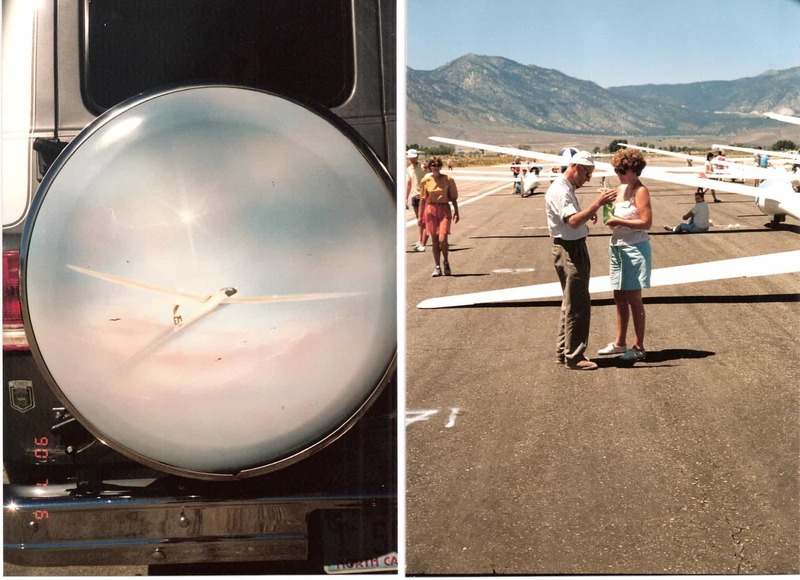 Minden Nevada , dream for wave pilots !Pictures from 1990 in Minden. The last- but- one- day brought UK Tim back to the overall-top. He had his “off-day” earlier, Uwe had one this day. He still fought to come home and was the last of the 15 from 46 starting pilots, to finish. So still 742 points for him, but he dropped to a 2d overall spot .Tim was 3d, Adam 5th and Sven 14th. Tim;4.862 points. 2; Uwe only 17 points less 4.845, so EVERYTHING is possible 3;Jacek with 4.786. Still in the race as well Czech pilot David with 4.753. LAST DAY; 3 hour AAT’s for all classes. Uwe started at 13.25 and Tim, Adam and Sven ,8 minutes later. Jacek was 3d for the day and as Uwe was 8th he passed Uwe to take over spot 2. Tim was 5th, Adam 10th and Sven 16th with David on 9. 2. 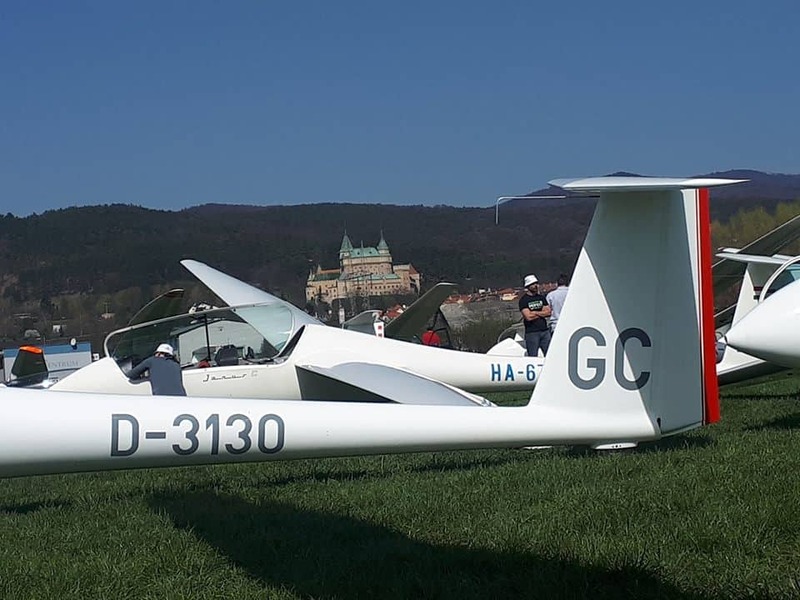 Jacek Flis [Poland] SZD-48 Jantar std. 2 …..5.743 points. 3. Uwe Wahlig [Germany] LS-3 WL/15 m………5,737 points difference only 6 points!!!! The happy top 5, with big smiles! One but last day; 6 from 31 finished and 2 of them were LADIES Jana won in her LS 8 and Dana was on spot 4. A Czech day with 4 in the daily lead. Overall with one day to go the top is ; 1. Mateusz Siodloczek from Poland 4.096,2. Miloslav Cink from Czech Rep. 4,081 and 3 Pavel Louzecky also from Czech Rep with 4,058 points. The last day was won by Radek Krejcirik good on him;361 km. in 3.01 ! He moved from 8 to 5. Pavel moved over the last 3 days from 7 to 3 and now 2. Mateusz who was on spot 1 lost 207 points on this last day and with points-so-close you can’t afford that ; he finished as 3d. WOW!!!!! All so very CLOSE, they really had a “fight” for the best place. Only happy smiles as well in this class. one but last day;3 from 25 finished ! !Danes Grula who is flying very well over the last day’s , Sebastian and Gintas Zube. Nearly all other pilots flew over 200 km. Sebastian leads the overall score with 201 points over his Polish mate Piotr and Czech pilot Danes. Sebastian won also the last day!! 377 km. for him much better than the runner up so a class apart. He won 6 day’s!!!!! Fabulous!! !His mate Piotr was 3d. As always beer and goulash after the prize-giving finished this yearly event. The combie winners with well known Petr Krejcirik on 4. 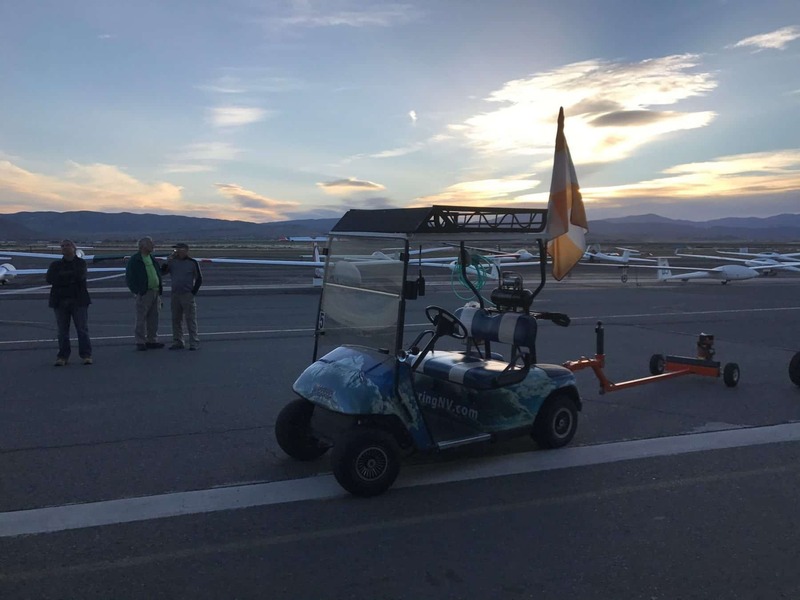 As promised some more news from wave paradise MINDEN in NEVADA. 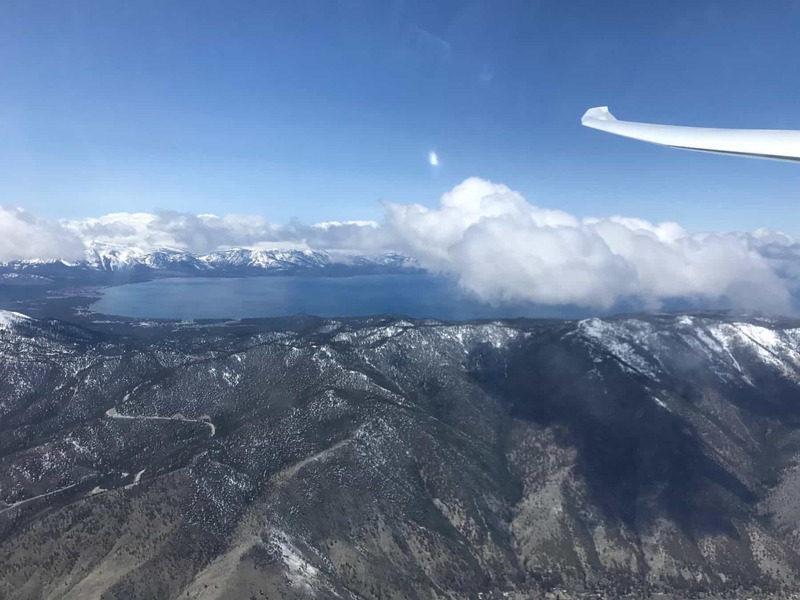 Close to beautiful Lake Tahoe and not far from Truckee and Ily both gliding fields as well. On the 15th a new long flight was added from Minden in the ARCUS M by Dennis and Morgan;1.798 km. with a speed of 157 km./h. 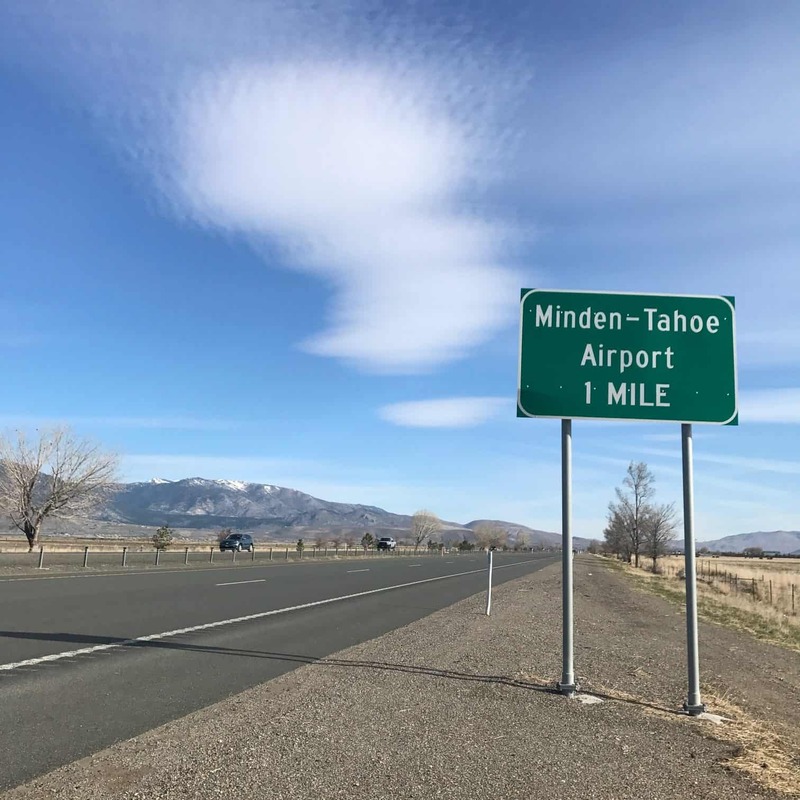 Minden is the place where the 1991 WGC was supposed to be , but the firebrigade with their huge planes had to be able to fly out at any time, and that’s not convenient during finishes from fast gliders so it was moved to Uvalde a great place as well. In spring and autumn ultimate wave conditions and in summer great thermals. Ridge flying is possible as well as “following” convergence-lines. VERY IMPORTANT; When you go there as a foreigner and you want to fly solo, you have to have a FAA verification certificate and it might be about 60 day’s before you have that !!! It might,…. as I heard sometimes it’s quicker. 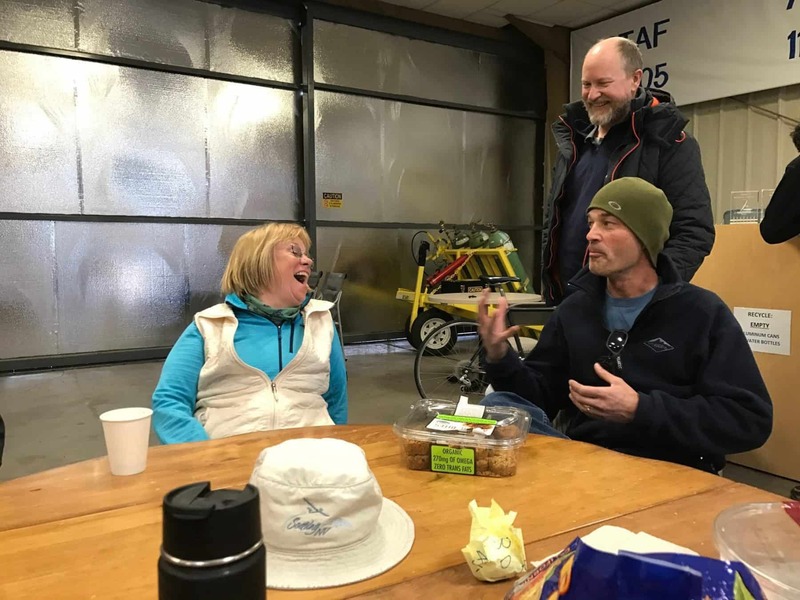 All the business from the past are not there anymore but it seems that a very nice couple Laurie …”GLIDERGIRL”…and Silvio are so kind that pilots as Jeppe are over -enthusiast, which is GOOD. The tuggie seems great fun and good,not unimportant either,… so a place to go too. 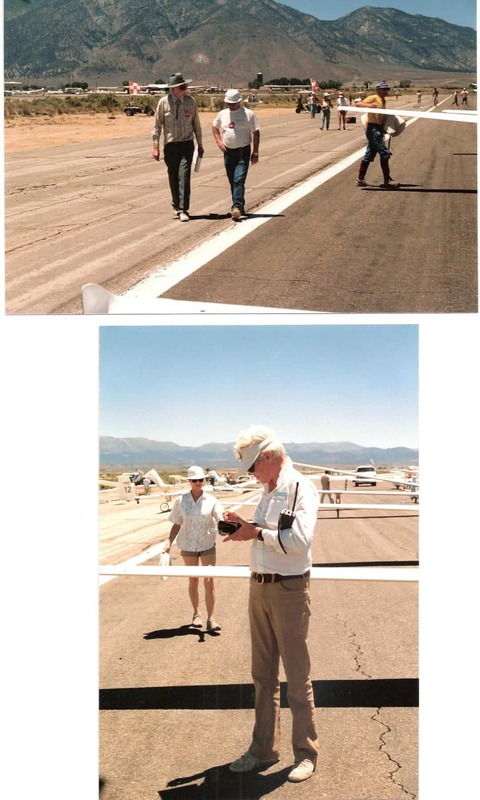 Here are some pictures to show you who is who and what was happening in the week Jeppe [KLM pilot] was there. Still the golf car’s as I remember them and some REAL characters; Tuggie Gabe and meteoman Dan Gudgel. SoaringNV owner Laurie, Silvio and Cloud Appreciation Society founder Gavin Pretor-Pinney having a laugh. Wave paradise Minden in Nevada USA. Talking about Minden,…Our own holiday there was great fun. Some great flying by my team, Sikko, Daan, George Rob and Gerrit. Bertje flew there as well a bit earlier.We went on a day off to Carson City, to Reno and to Lake Tahoe. 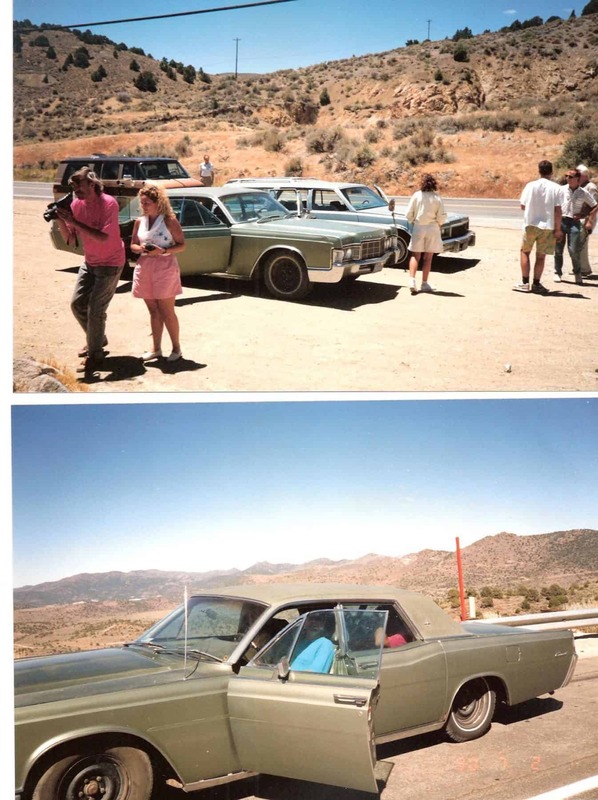 AMERIGLIDE was in July 1990 ; here some pictures from long ago!!! 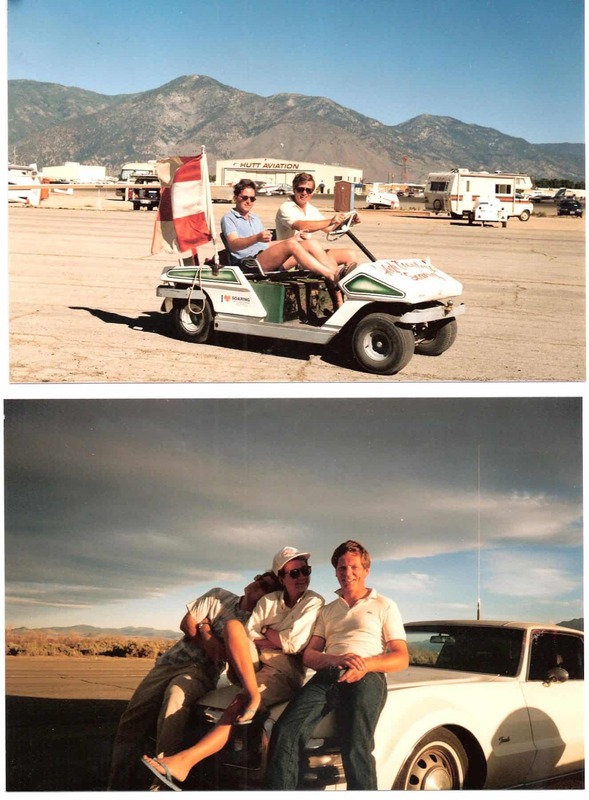 Sikko and Bert in the golf car and Robert Bert and I on one of the American car’s. Hannes Linke and Bernald Smith the orgaznizers and George Moffat with Susan. George as video-amateur and [ Paula from Brazil] , checking if he is doing things right. The REAL American car’s . George took the green one, a CONTINENTAL, with suicide doors, HOME !!! A day off so a flight with the ALBATROS. 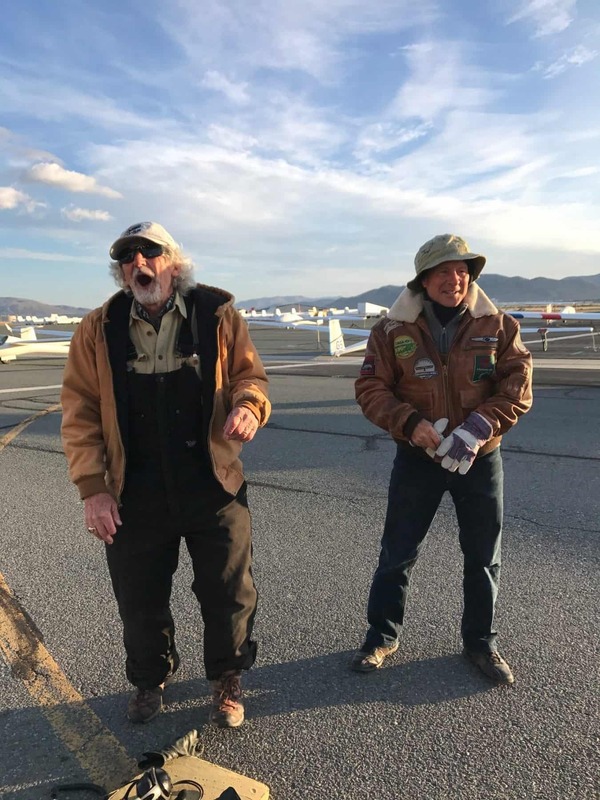 George was allowed to fly with owner Joe Lodato, cause it was his birthday. 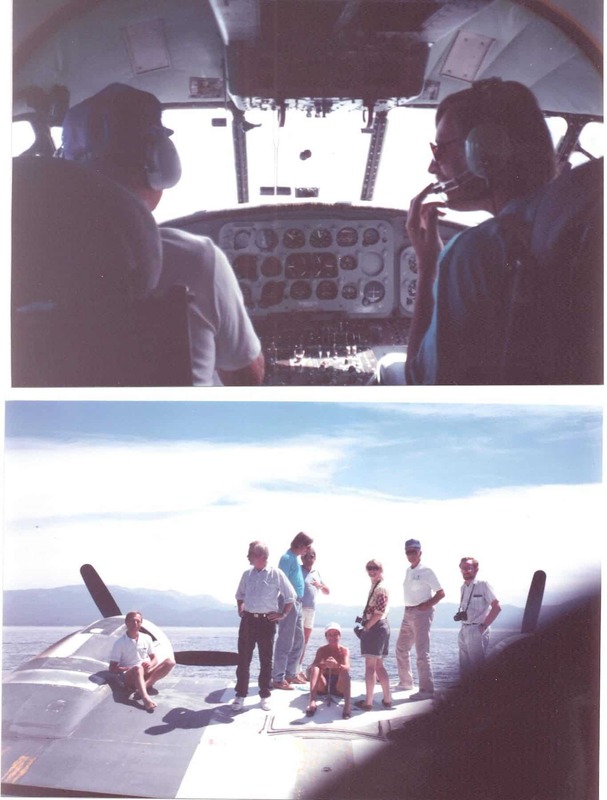 After the landing on the Lake TAHOE we had a pick-nick on the wings. What a day !!! !Later George bought the “bloody” amphibian and after a while he flew it to Tocumwal, where it still is with one wing off. Finishes in 1990 in Minden. The Dutch team …. Great clouds and a smiling Mary and Christianne holding the wing. With Eric Moser, Andy Davis, Justin Wills, Klaus Holighaus [RIP] Rick Walters [RIP] Daan Pare and one person I can’t remember. No words needed, as always,…. all in good order. all gliders safely back home. Very blue skies for day 1. As shared by the Soaring Society of South Africa. 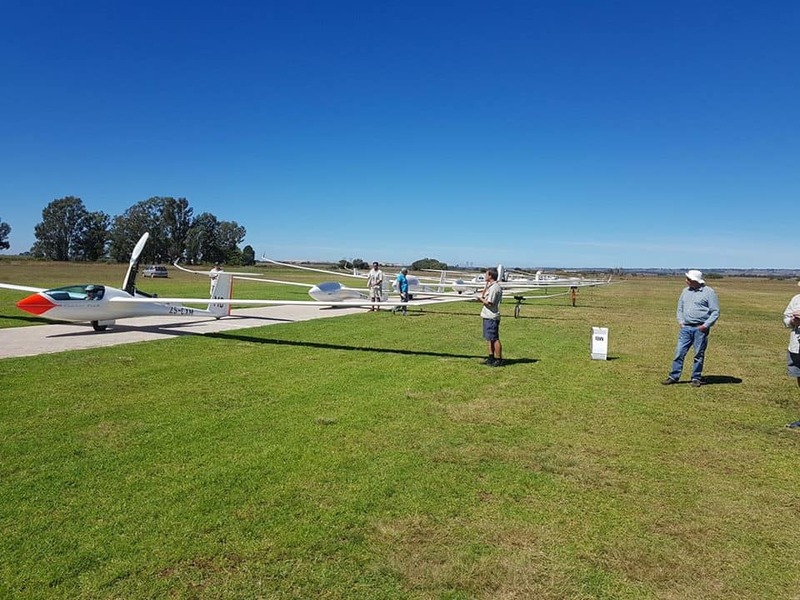 With 5 pilots in 15 m and 8 in open this regional competition started with 197 km in 15 m. flown by 4 and 275 km. in open with 3 finishers; Oscar won in the JS 3 ;846 points. The other JS 3 was runner up with Anders Andersen . Task 2 was cancelled for 15 m. and open got a tiny little task from 182 km. A tough day even with the small distance. Only 2 from 11 finished. 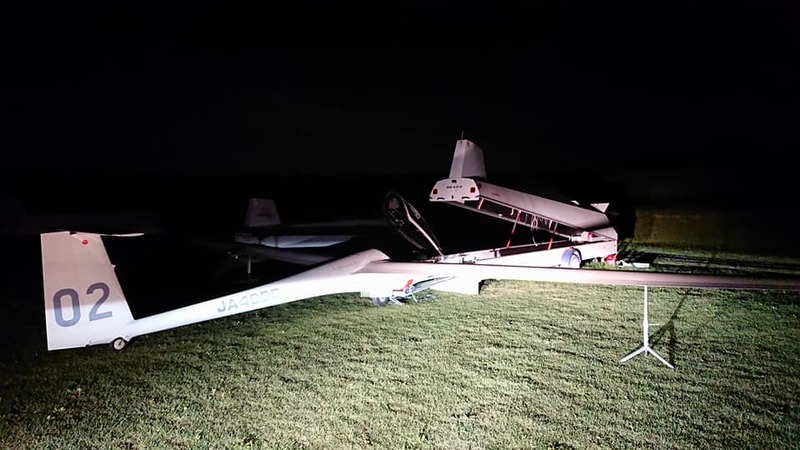 Anders and Dolf Pistorius managed to come home in a JS 3 and a JS 1 /21 m. Oscar was “out” after 161 km. loosing a bit more than 100 points on Anders. Kiki at the MESSE in Friedrichshafen. We had up to 30 dgr. C about 15 higher than normal. Spoiled!!! Now it’s back to the normal 14 !!!! Brrr….cold!! 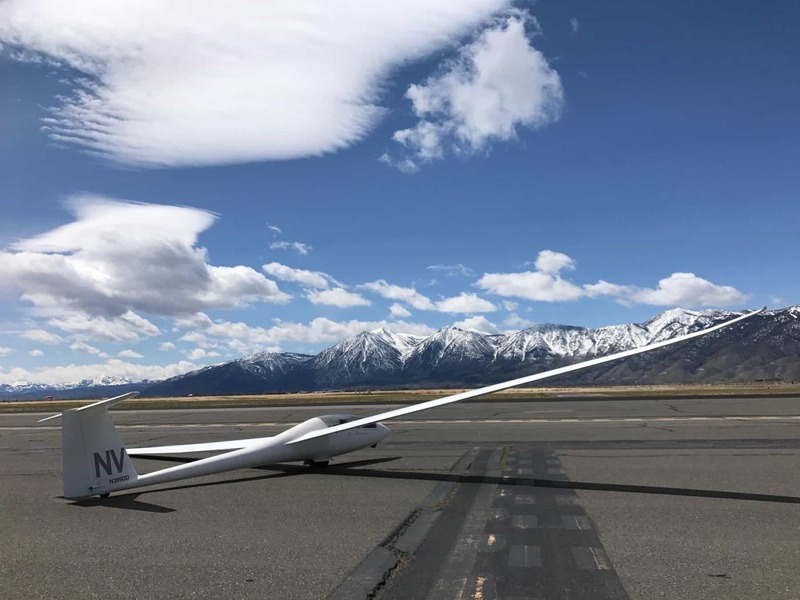 On Friday the USA had some top-ridge-soaring from Ridge Soaring where Dan had a FANTASTIC day in his 18 m./ ASG 29 cruising over the tops with a speed of 169.85 km./h over 1.204,81 km !!!!! On Saturday the Alps were ON , over a great area but not yet a 1000 km. 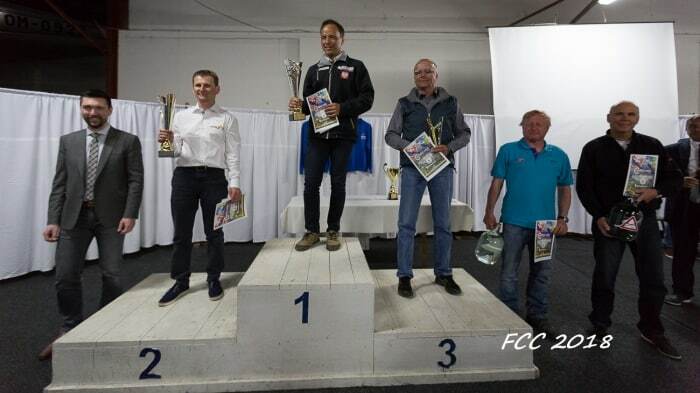 That happened on Sunday when Matthias flew 1.096,50 in the Quintus from Koenigsdorf ,Gerhard 1.000 in an Ventus 2 CM and Bernd Weber flew over 1000 in the Ventus 3 from Laichingen. Several over 800 and 900 km. races as well. In an ASH 26 E 2 good flights from Unterwoessen  and Koenigsdorf [850 km.] well done !!! 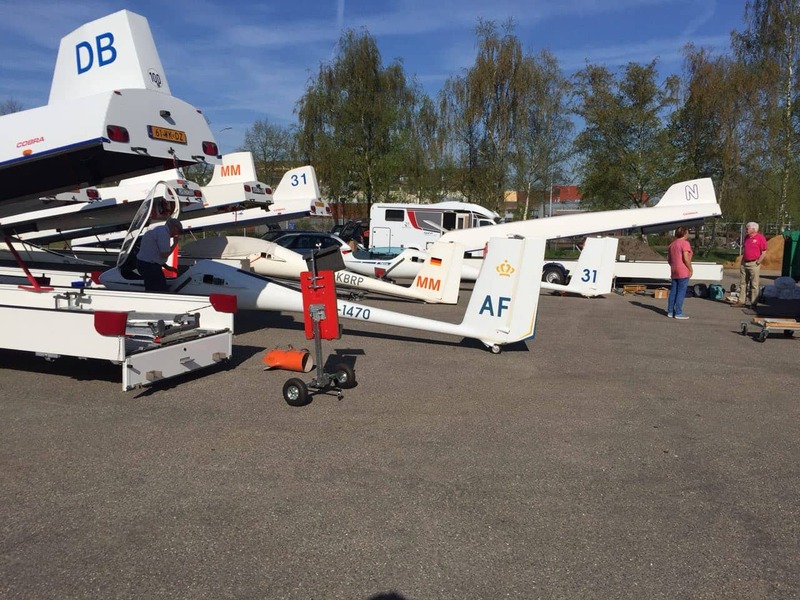 Last Friday 2 Dutch kilometer-eaters Alfred Paul and Mark flew from Soesterberg, far south deep in to Belgium passing even St Hubert [where the Belgium Nationals will be flown soon] into Germany ; just a few km’s short of 700 km !!!!! They stayed in welcoming-Marpingen as they try to do a little safari. 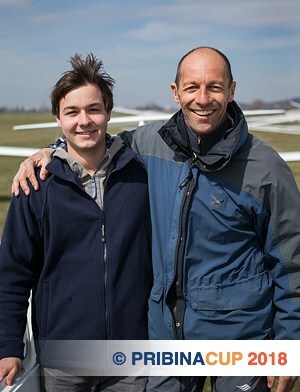 Monday 2 juniors from Holland, Sjors and Lizzy flew 615 km. in the Duo Discus XLT from Soesterberg direction East far in to Germany!!! Chapeau, as they went easy with the wind, but it was tough back against the wind. 15 Dutch pilots had time to fly that day and 8 flew over 400 km. Good Dutch day’s!! Yesterday the Hahnweide was “HOT” and 2 ARCUS types T and M flew over 1000 km !!! 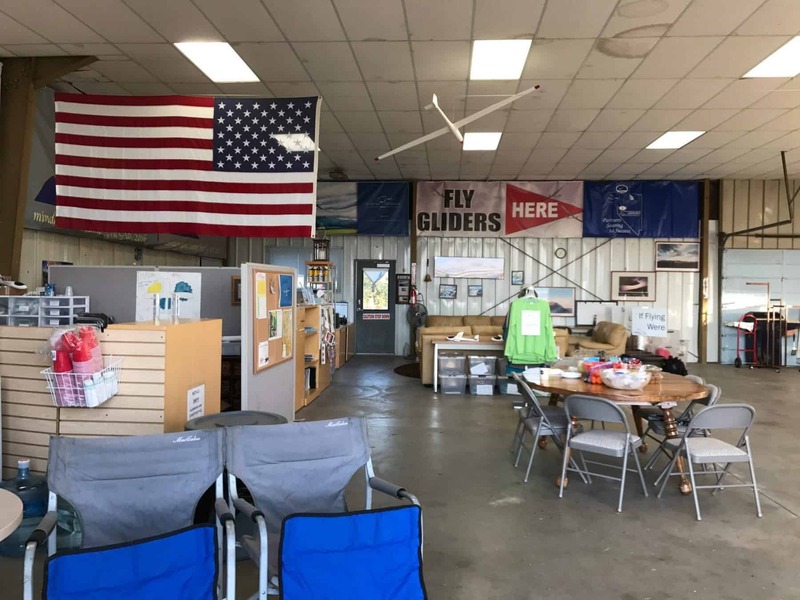 By the way last Saturday gave 2141 pilots, who added their flights on the OLC, huge fun.The season is really “on” now. 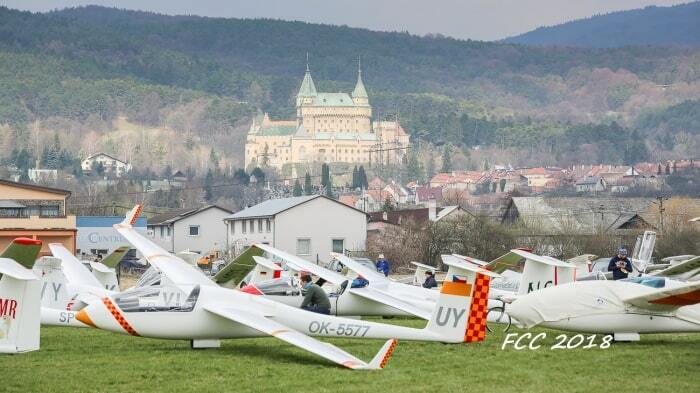 FCC Gliding in Prievidza ! Minden ! 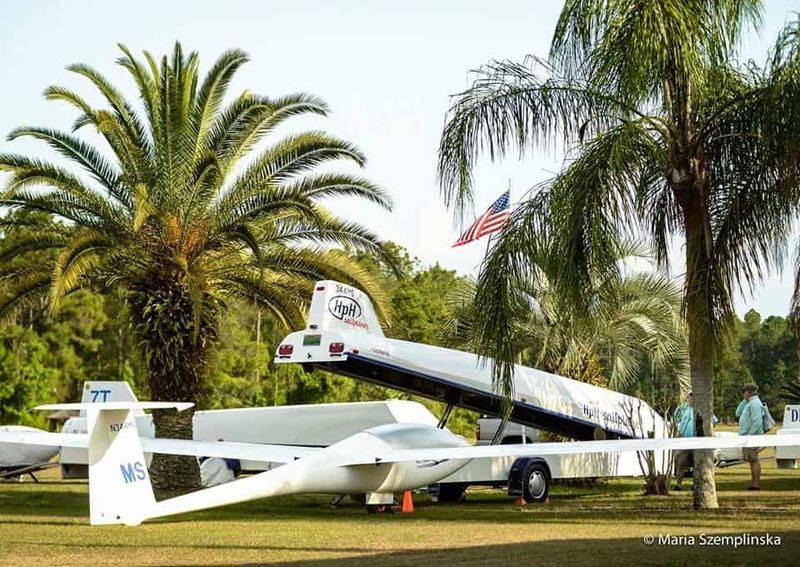 DG and Schempp-Hirth-news…The MINIMOA….new SH Magazine ! 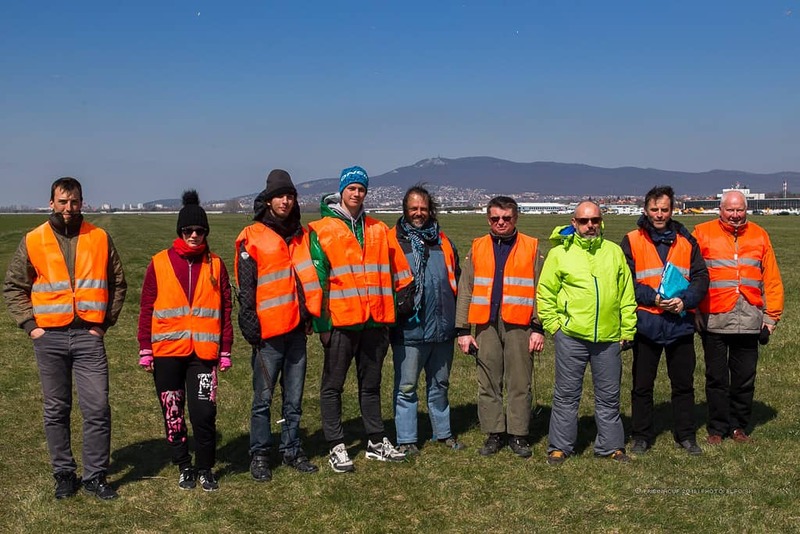 A lot of pilots and ,indeed their crews as well, remember fondly the WGC in Prievidza in Slovakia. 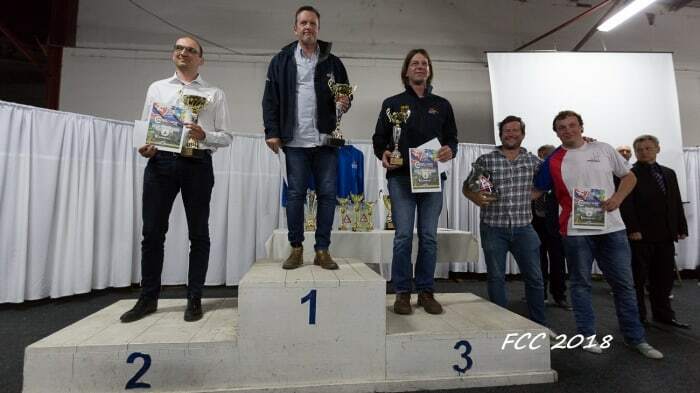 So this years FCC ….Flight Challence Cup….competition is attended again by several of those guests and/or new ones hearing about that WGC. In club class Adam Woolley from Australia and Sven Olivier from South Africa are participating at the moment. 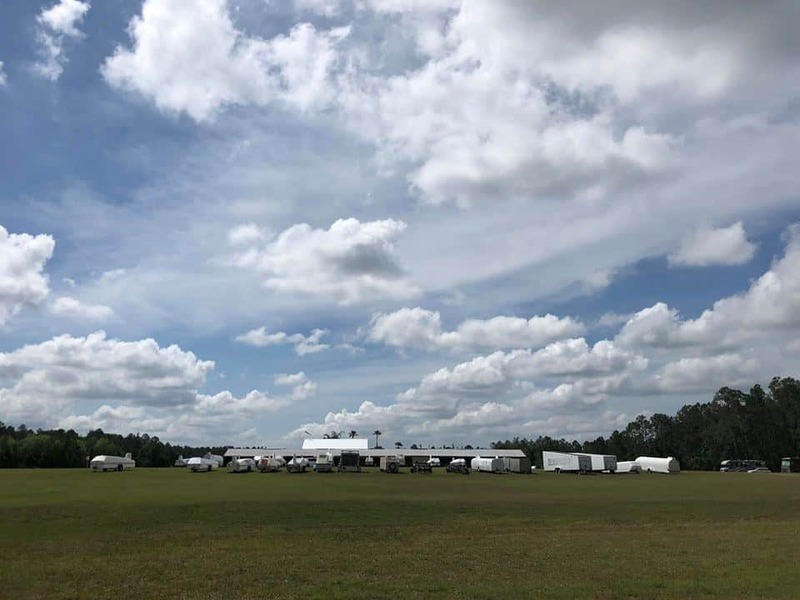 Adam mentioned in his blog ….the next news about day 2 and as he is there who else can better share what’s happening. The day was expected to be blue, which mainly it was. A 2.5hr AAT was set into the mountains today, thankfully with valleys to fall off either side too. Sebastian Kawa kindly sat next to us in briefing, then helped us task plan – was really nice of him, thanks mate! We launched into the blue sky, 48 club class gliders all scratching around, avoiding each other & the hills in the gusty & weak climbs. Right at the moment the inversion broke, the next two classes were sent. 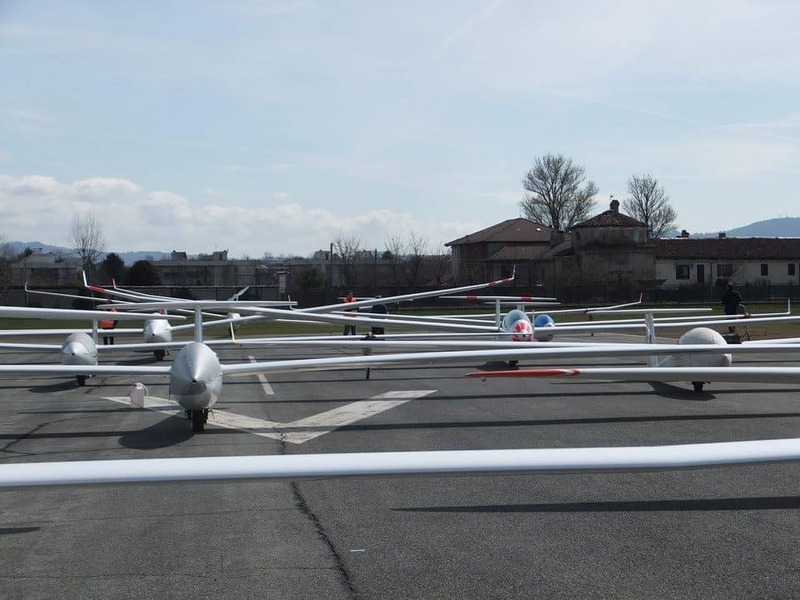 The pre start gaggle was separated into 2 cores effectively, 110 gliders all very close – Cirruses to open class birds. 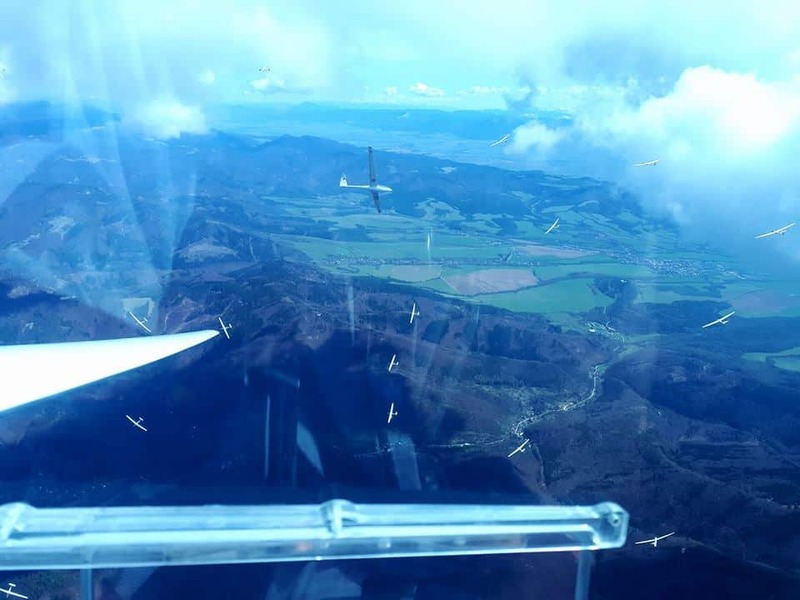 I made my start at I think the optimum time, but sure was exciting flying head on to 50 gliders for a few minutes as they were fighting for their own position. Thankfully every one was well behaved mostly & all ended well. The flight track went as per task planning for me. 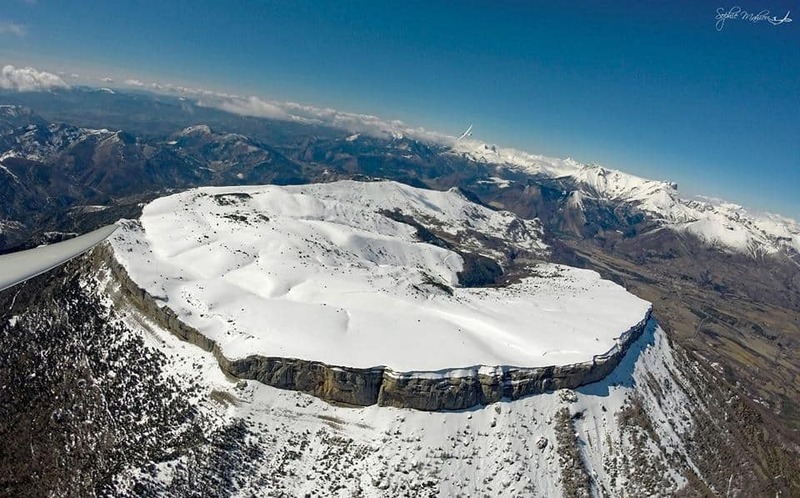 It was super interesting learning how to fly in the mountains with the strong wind, all the time I just did what I felt was right, even though I felt slow. The effect on the light Cirrus against a mountain in the winds were certainly interesting, some climbs smooth, some crazy washing machine stuff – a real work out. When I left you they wanted to start with race 3 , but that Tuesday was cancelled. Set tasks on Wednesday then….213 km. for club, 224 for 15 m. and the “combies” went for 260 km. AND,….in CLUB Adam was runner up for the day!So his learning curve nearly reached the TOP for that day. Uwe from Germany just was a tad faster in his LS 3 WL/15 m..Looking at points…3 more than Adam;86,69 km./h for 81,66 km./h. Handicap difference; 104.4 for 98.6. In 15 m. was it great to see that one of the juniors from a few years ago, Miloslav Cink [Czech Rep] won the day in an LS 8b. 19 From 33 finished, indeed it showed that it was a tough day. In the combi-class it was waiting for the name Sebastian on top, but he is a human being as well and this time he was “OUT” after 209 km. 10 from 23 only finished and the daily best was German pilot Andre Weidlich flying an ARCUS. A grid squat occurred for 1:10 today, the thick high Cirrus affected the launch time. Luckily though the air was rather unstable & it was easy to climb away, mostly. I did struggle to get to altitude pre-start though, leaving below base at my cut off time. I jagged a good first climb, this naturally started the feel for the day. Some ridge running then a cracking climb to base at the downwind turn, saw me catch up my team mates here, Sven & Tim. We’ve been having a great timeworking together & pushing each other along, thanks guys! The headwind leg saw us having to start getting creative in the thick high Cirrus, we picked our way through the hills & the dying CU. Keep moving, keep moving. We picked up final glide nicely & had a slow but reasonably fast run home. I finished 2nd for the day by 3pts, but believe the #1 finishers handicap is out by 0.005 in my favor – so maybe my first day win? Either way, I’m now in 4th, but still 5 more days to fly?! Race 4 was last Thursday ; they set 310 for club , 328 for 15 m. class and the “combies” had to go for 368 km. Nearly all in CLUB finished [only 3 out] and it shows that a bit of practice before ,helps as Uwe won again. He was already good in Nitra [Czech Rep] but even better in Prievidza. So 899 points for him. Being 29th , Adam had a bit of an off-day. 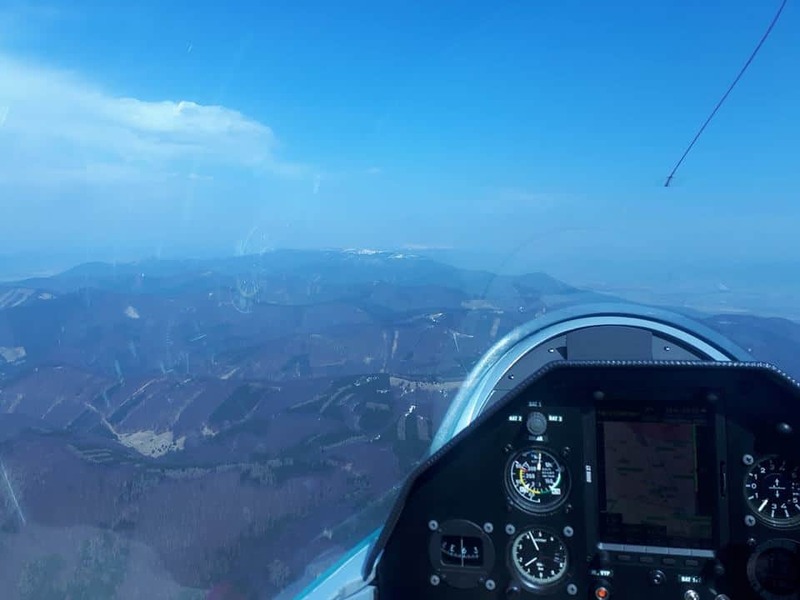 His comment;“It wasn’t my day, disorientated with the first track – took the wrong line town the hills, plus questions over the airspace, stayed safe & came to the first turn from the wrong direction. From there I had my bearings & started to catch the pack up, but the damage was done. After 4 flying day’s it’s Uwe, Tim and Darius on the best overall scores. In 15 m; young Radek Krejcirik won the day with a speed of 135.29 km./h. Good on him. 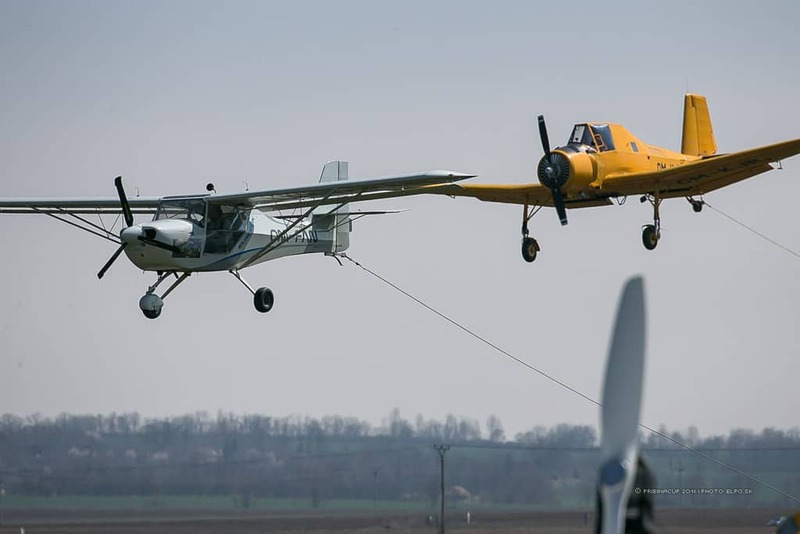 After 4 day’s it was Polish pilot Przemysław Bartczakon top [ 2.982], with Romanian pilot Norbert Alin Scarlat as runner up [2.933] and then 4 Czech pilots Radek, [2.982] Miloslav [2.923] and Pavel [2.914] and as you can see the differences were SMALL. 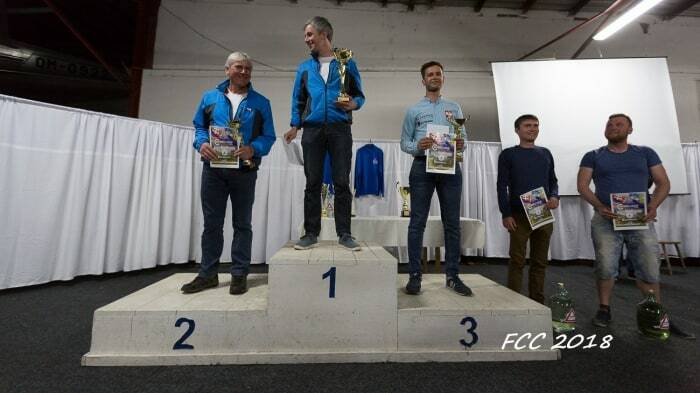 In the combi class it was back to normal for Sebastian , he won with a speed of 140 km./h.!! After 4 day’s 2 Polish glider pilots in the top 3 ;Piotr Jarysz on 1 and Sebastian back from 6 to 3. In the middle Czech pilot Petr Krejcirik. This morning I noticed looking at the weather map on my TV, some “wild” weather in the East of Europe and it turned out not a flying day on Friday the 13th. Maybe better for those who believe in “black cat’s”.But after,…….. Task 5 was BIG in all classes!!! Club had 500, and Uwe and Adam were on top for 1000 and 989 points; speed just over and just under 100 km./h. 29 from 47 finished , some were close very close ;494 from 500 km. Here is Adam;”A 500km fixed task was set, 11am launch & a 1700-1730 shut down predicted. That meant one thing, get cracking! I was in the first wave off tow, sat in zero for a while, then edged my way up the mountain. I noticed that there was a rather large convergence line running up the 1st leg, so went to explore it early & found myself marking the spot for every one else to join in. 505 in 15 m. but this day was cancelled due to a midair collision.”Fortunately two parachutes were observed.We would later learn that the Lithuanian pilot , exited the glider very low – and was probably saved by the high trees which caught his opening parachute and arrested his impact. “Also the Polish pilot was OK.
Combi had 512 and Sebastian added more points to his total;1000. Roman [Mracek] had 989. Club did not have a valid day though they flew, but no 25 % of the pilots finished as most did not start. Adam got no points but lot’s of CREDIT for him. Sven wrote; “Adam lead the gaggle around the task and 6 guys managaged to complete it – in my view the feat of the contest. 15 m; was cancelled later as well also here some heroes who started, flew the task and finished but not enough. Only 2 of the 6 starters finished and flew 183 km. in 3 hours; Rumanian pilot Alex Pop and Lucasz Grabowski from Poland. No points but GLORY!!! Task 7 yesterday; Not the best weather in the morning but improving.In EASTERN countries they are used to fly whenever possible, so 2 hour AAT’s were set. 7 From 45 finished …..with between 138 and 170 km. ……and indeed JUST 25 % flew over 100 km. .so a valid day and some “shuffles” in the overall scores. [www.soaringspot.com] Though the top 3 is STILL the top 3; Uwe Tim and Jacek. 15 m;26 started and 9 finished with up to 193 km. Combi; Sebastian won the day. 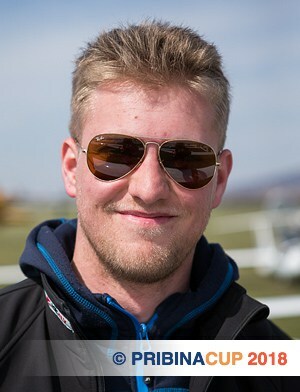 Romanian pilot Andreas did well as runner up and moved to spot 3 overall behind Sebastian and Piotr. Today they have set tasks;club 226,15 m. 264 and combi 307km. 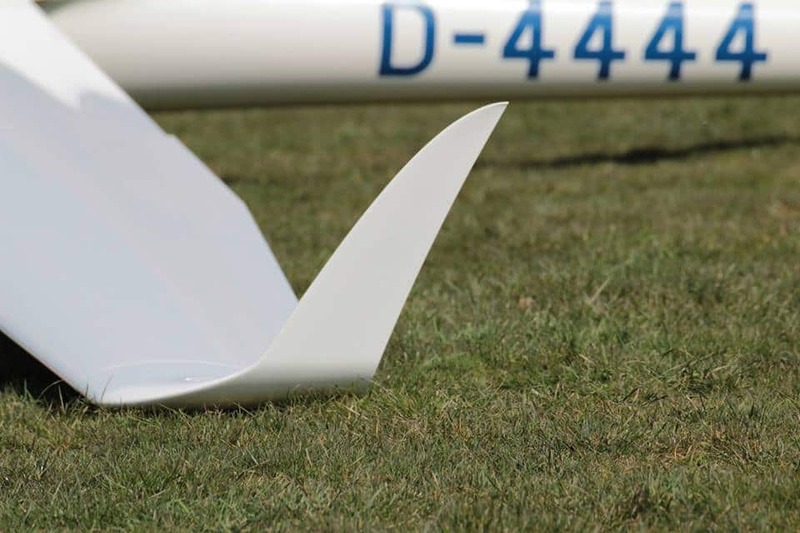 “During the last months, we’ve been asked quite frequently if the new “neo” winglets will be available for LS4 gliders. 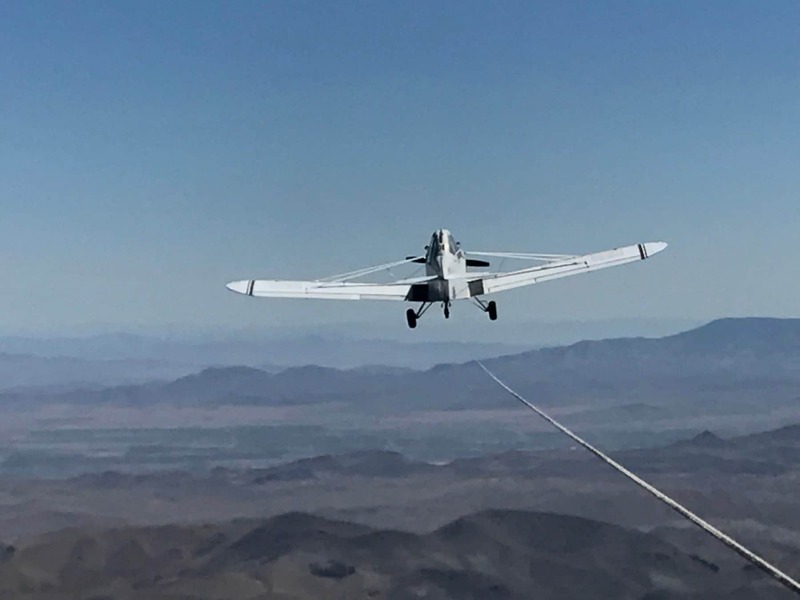 Based on very good results with neo-winglets, which DG developed during the past 2 years, we can expect a perceptible increase in performance for the LS4 as well. The LS8 shows an increase in both, handling and performance. So now we offer this kind of development and ask LS4 owners to place an option. Only a few options are left to kick-off this exciting project. Development will follow the aim to keep maximum cockpit load as it is and to carry as much water ballast as possible with this configuration. Following the new handicap list, the LS4 also becomes very interesting in club class. More news on facebook.com/DGFlugzeugbau or on their site. Wing lets for ALL series of the LS 4. “Hello ! 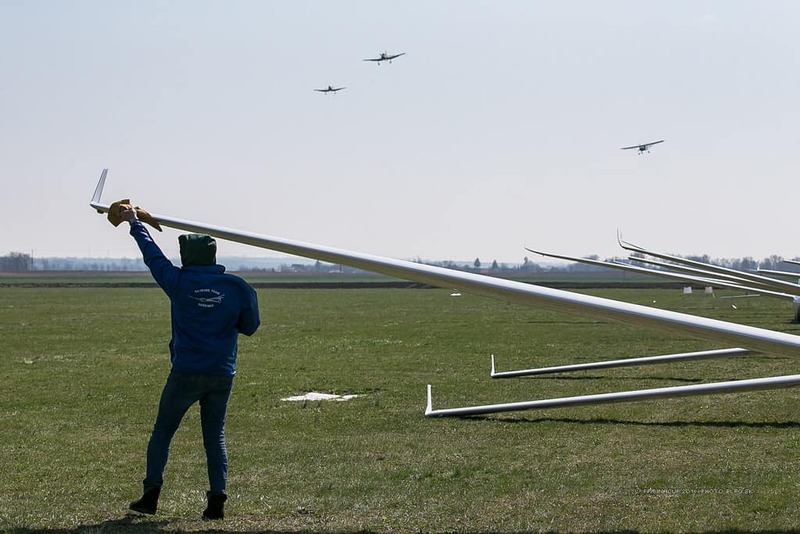 From July 31st to August 10th this summer, will be held the 44th Bailleau International Gliding Contest, a classic flat-land gliding contest. 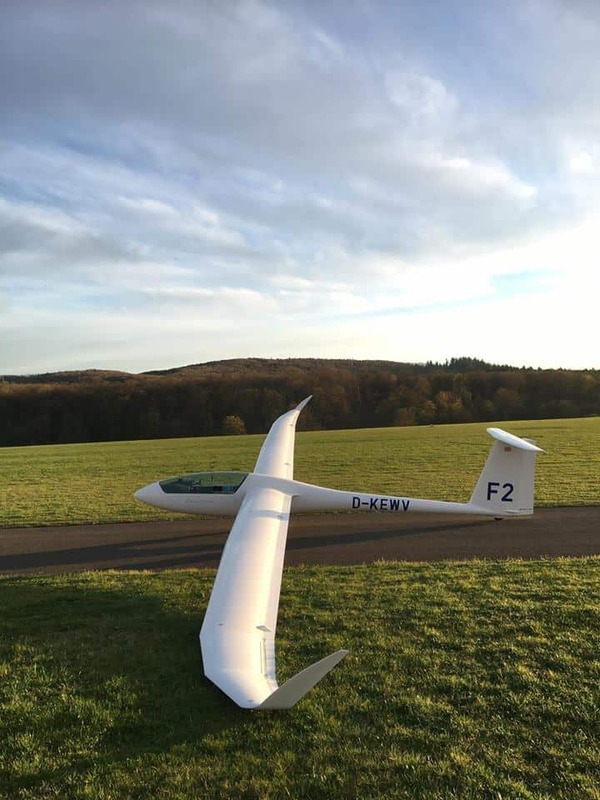 The new 15 m. Ventus 3 has been tested as I read;”Congratulations Schempp-Hirth on the first flights of the new Ventus 3 15m! 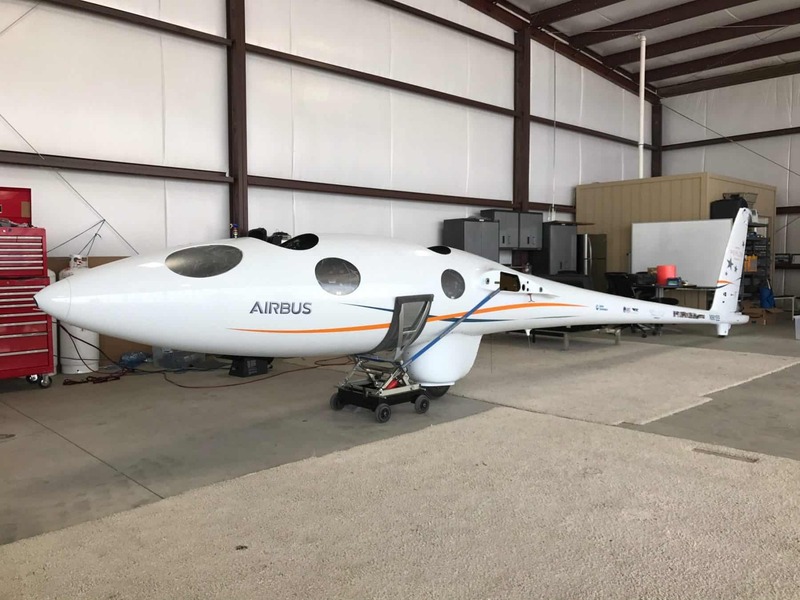 Looks wonderful, I hear the three test pilots on day one are very pleased & are yet again, impressed with its handling – love it :…by Adam. Photo taken by Derren Francis of his 1 production set. 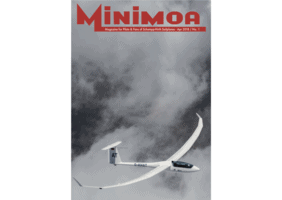 And,..the first edition of the new MAGAZINE MINIMOA, has been published, a magazine for all pilots and Schempp-Hirth fan’s. Had a look,…. love the lay-out and great stories and pictures. I like both Tilo and Ralf, know them for ages and as George always flew SH gliders, we ordered a few with them and in the past visited regularly. Ralf visited us with Klaus in Tocumwal. 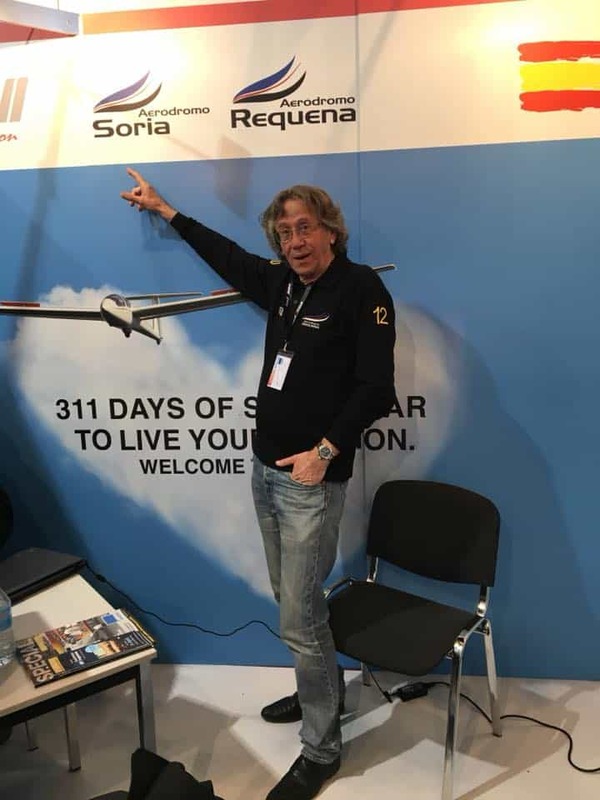 Glad to see he is since a couple of years part of Schempp–Hirth and he is the editor for the new magazine whilst french Benjamin Neglais does the lay-out and pictures. Benjamin fits very well in the SH family. Great cooperation !!!! As far as I know one of my friends Hans, still has a MINIMOA. And the cover of the April issue the first of I hope , many more. Allan Barnes flew on Friday the 13th still 571 km. in his LS 1f. Very active Foehn in the Alps. 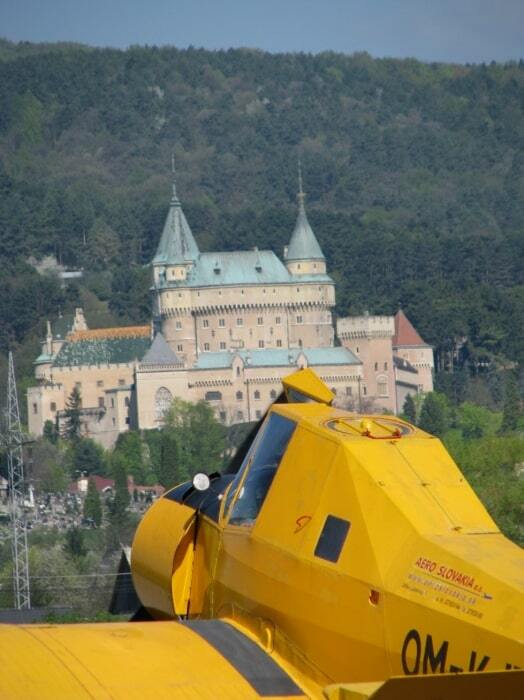 Switzerland ; with a great result for top pilot Rainer Crohnjaeger; 1.260 km. with a speed of 105,59 km./h !!!! Hausen am Albis was the place to be. 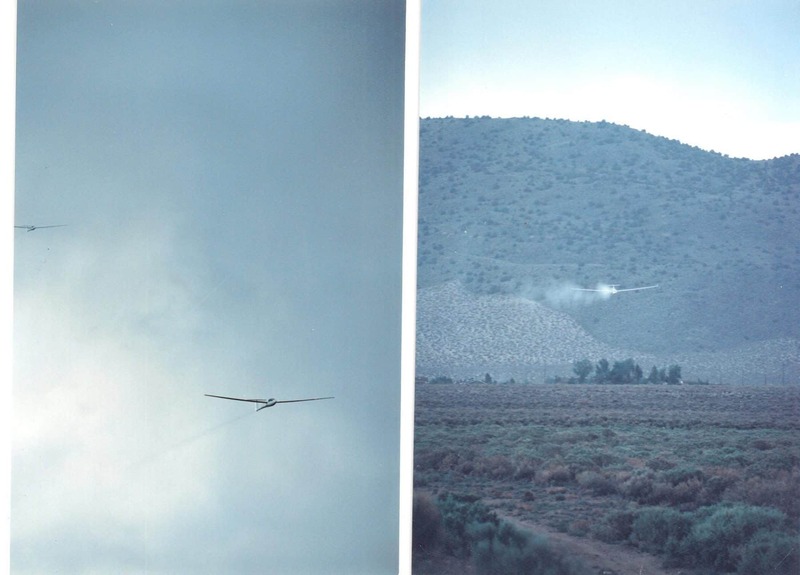 He flew the ASH 31 MI/21m. After rain and clouds there was wave . But the whole area was superb. 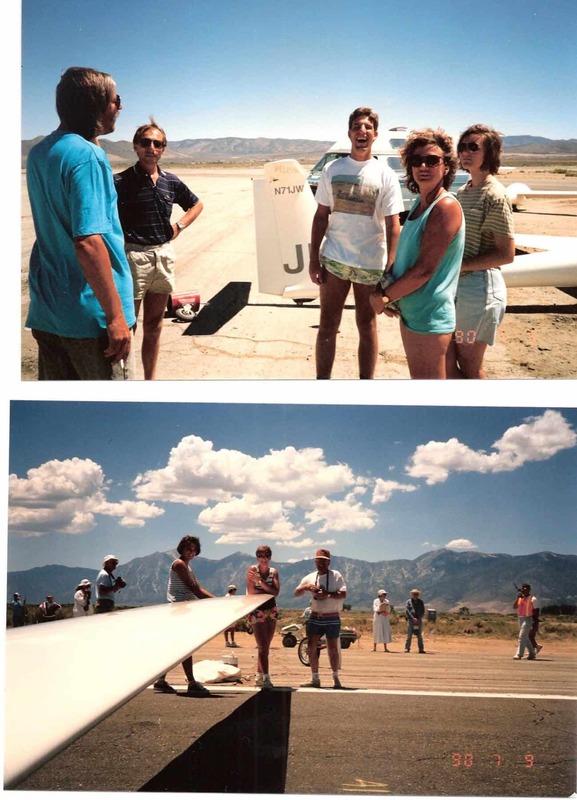 What about David Richter-Trummer in an H301, a club class glider!! !Niederoblarn [Austria] was for him the place to be; 1.134 km. with a speed of 95,52 km.h. 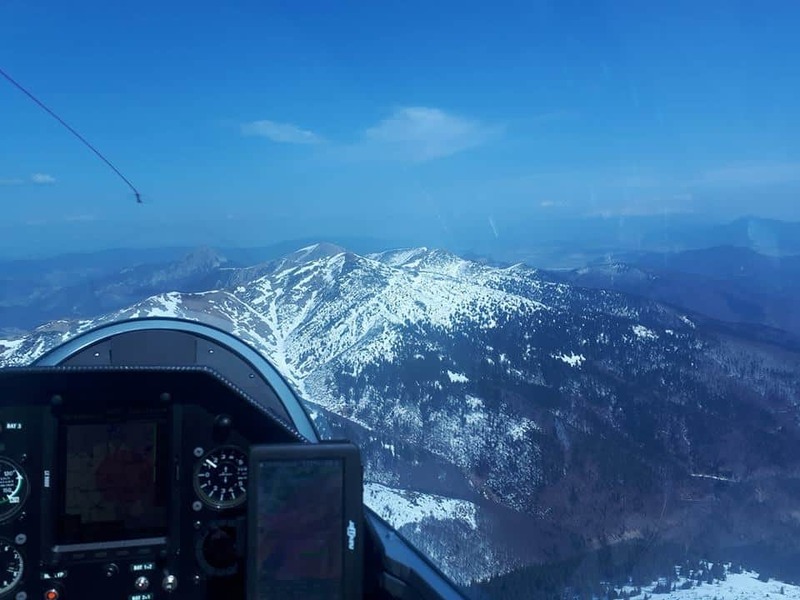 He “cruised” over the mountains at under 4000 m. and found good thermals as well. 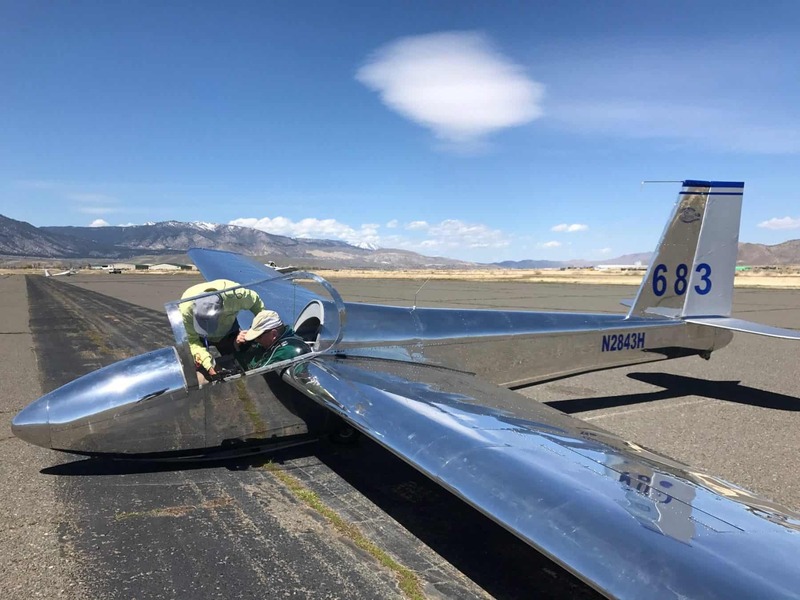 A few day’s earlier on Tuesday Keith Essex flew from more or less in his Minden [ USA], another great flight in the JS 1 C. This time 1,254.5 km. with a speed of 153,6 km./h. 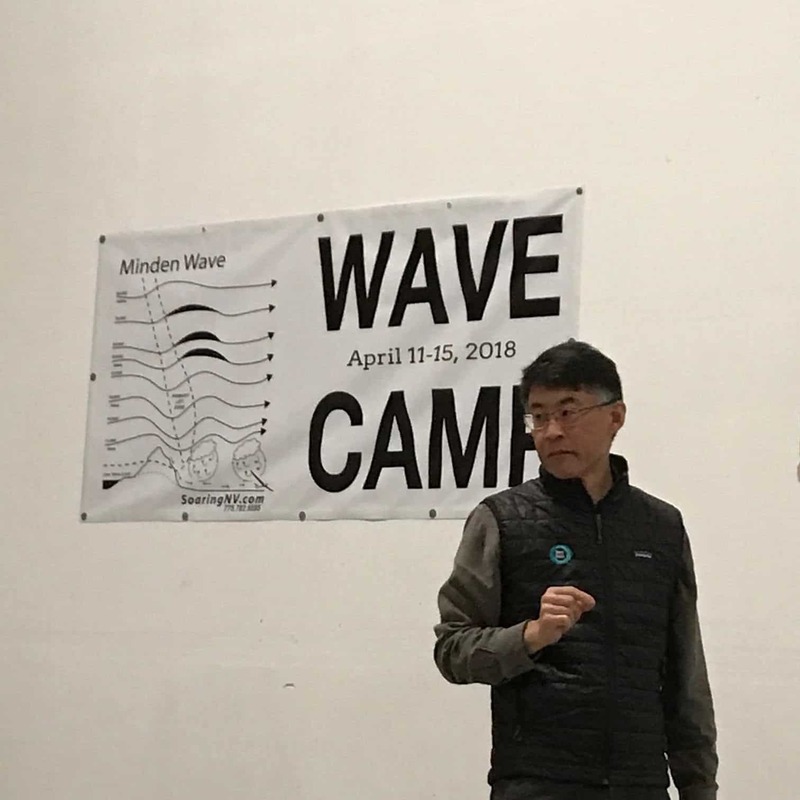 Talking about Minden,…they had a WAVE CAMP and one of my Dutch soaring friends Jeppe is there as well. He shared some news and great pictures. 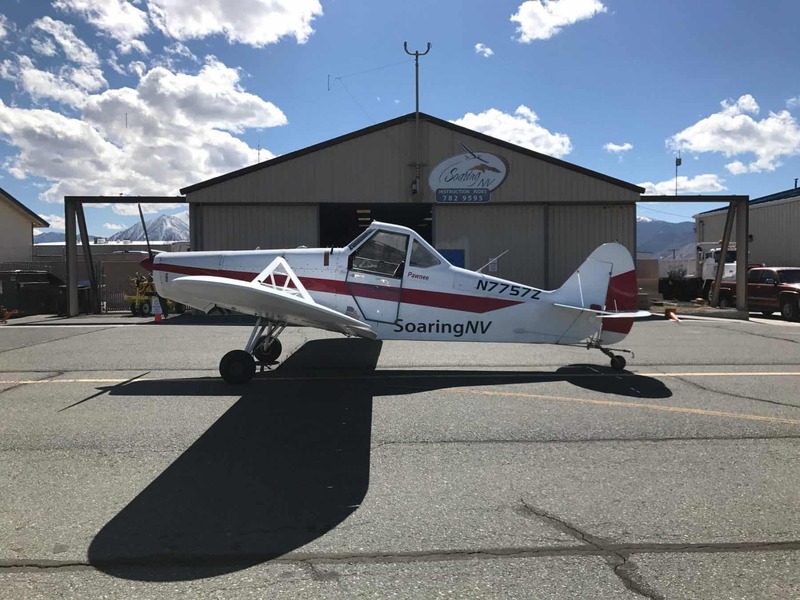 He mentioned the great atmosphere created by Laurie and Silvio, who started …SoaringNV.com… about 9 years ago; It seems the other 2 businesses from my time do not exist anymore. Of course they are super hosts on wave day’s , but also on less day’s they organize readings about p.e. Perlan or invite Gavin Pretor-Pinney, the founder of the Cloud appreciation society to drop in to share his experiences. 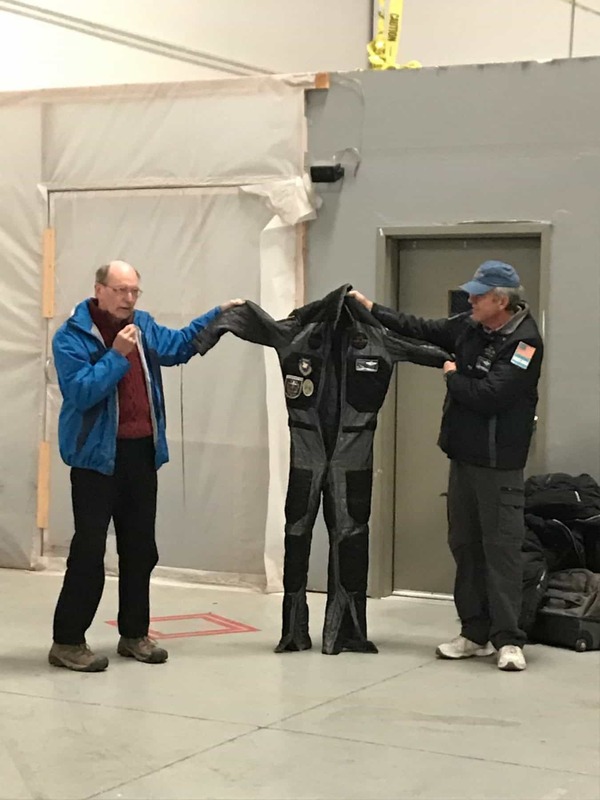 Perlan 2 and Dr. Johnson and Jim Payne talking about how to protect against the cold and possible hypothermia. Jeppe shared a picture from the Lake as well and I HAVE to share it. 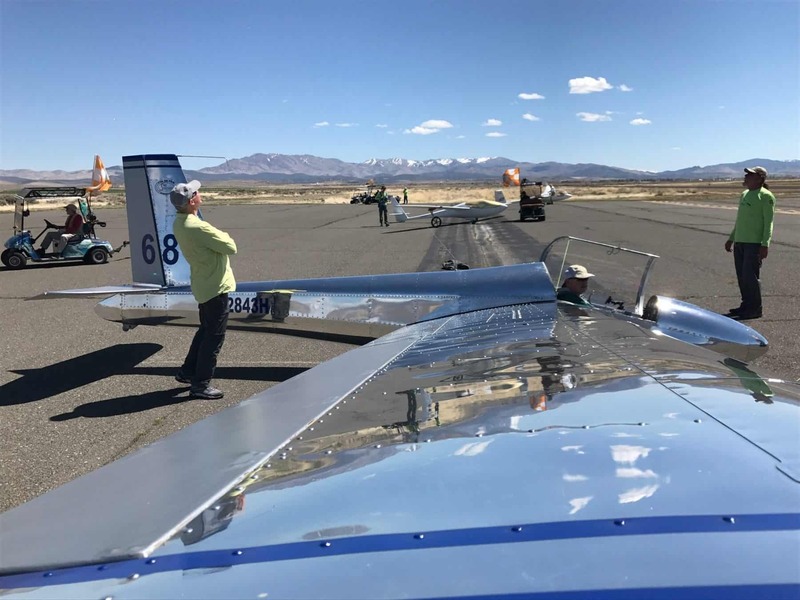 On Monday morning all pilots from the camp were up early , as it was supposed to be a super-wave day or a “diamond lennie-day” with 5000 m. ]16.400]height gain. It was 5 brand new DIAMONDS. “Back on the ground. Got upto 9000′ on tow and then into the wave near Kingsbury Grade in the leeside of Job’s Peak. 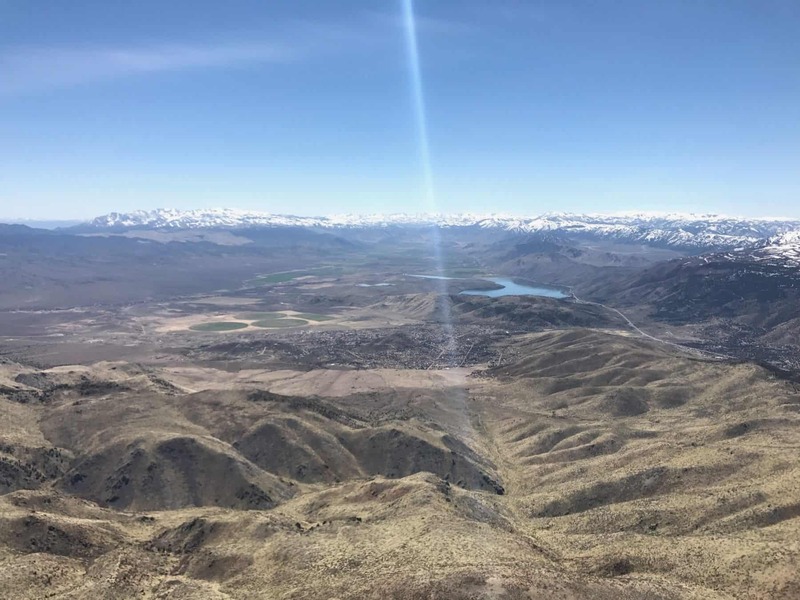 Upto 17500′ all the way and then northbound in the wave ‘highway’ to Carson City and south of Reno. 2. Lennie and shadow overhead the airport. The white hangar on the the left is the initial point (IP) for righthand downwind when RWY30 is in use. Next week more news and pictures from the WAVE PARADISE in Minden Nevada.THANKS Jeppe !!! No worries he will do it another day!!! 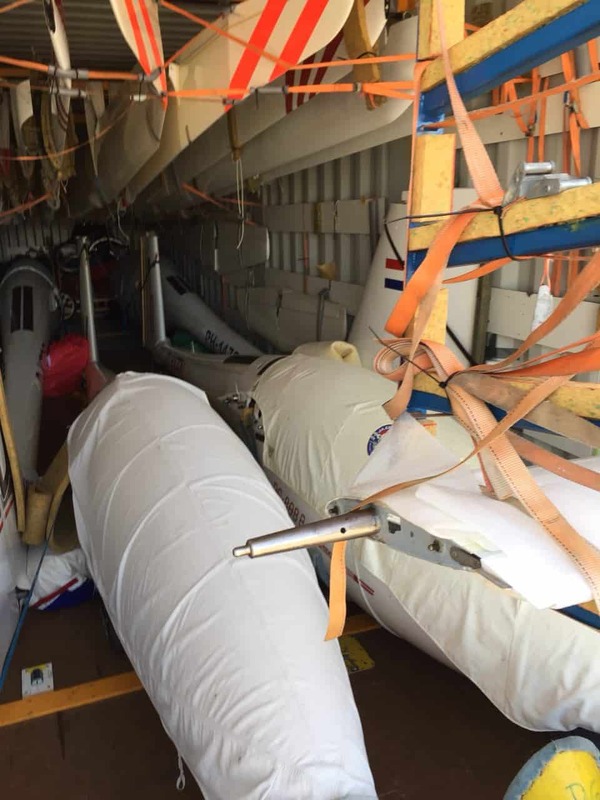 CU next week,by the way ,good soaring in Holland as well. 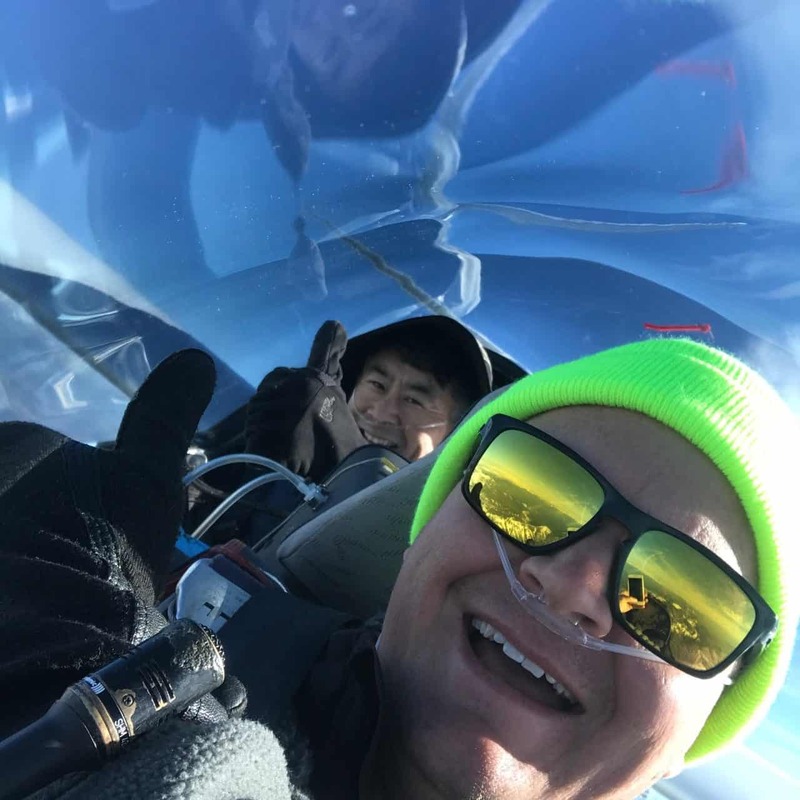 Steven Raimond flew yesterday 445 km. and the day before 515 !! Pribina Cup !Verified records 17/18 down under ! 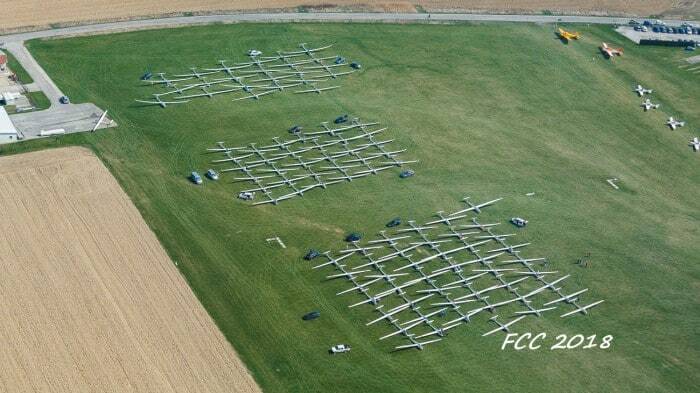 FCC Gliding 2018 ! 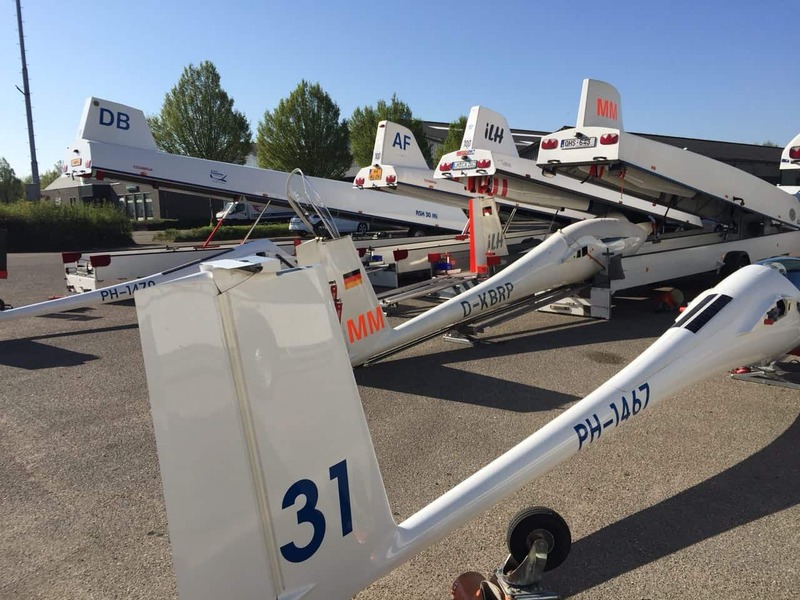 is in fact the first MAJOR competition for the beginning of the new European soaring season. Ostrow, Wielkopolski, is host for the 35th-WGC-club, standard and 15 m. pilots between 7–21 July 2018. What happened after last Wednesday in Nitra? Unfortunately not too much. Reason; the weather. 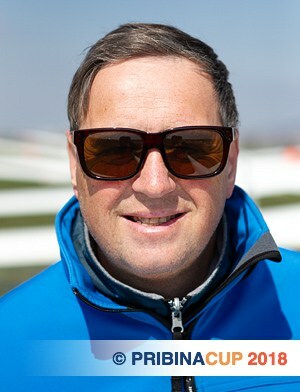 club;twice a 2d place for Michal Lesinger [Czech Rep] so pretty consistent flying in his ASW 19 and the NUMBER 1;1.380 points. Runner up with one win and an 11th place ,Uwe Wahlig from Germany 1.363. Followed by other German pilots with 1.351 and 1.325 points. 16 from 33 finished on day 1 . 15 m ;Jan Knischewski from Germany one 1 day with 1000 points and was 4th on the 2d day. Result; a 2d place in his LS 8 . [1.681] Just a tad better , so number 1, Polish pilot Tomasz Hornik in the Diana with 1.715. He won day 2 and was 3d on day 1. 7 From 25 finished on day 1 and Jan was the only one in the whole comps with 1000 points!!! 20 m. duo-seat; Team Wolfgang [Janowitsch] and young Thomas Leitgeb were the only finishers [from 12 teams] on day 1 and they were 3d on the 2.30 AAT. so with 1.648 points ….. the winners. 4 from 18 finished on day 1 Lucasz and Piotr belonged to them. On day 2 they were winner and runner up; Lucasz 1.598 and Piotr 1.591 points. Open and 15 m. Cup winners. All pictures shared by the organizers. Next year Easter will be later so hopefully better weather. Always very grateful for ALL those hardworking “helpers”. continued with their first competition of the year 2018 in Torino. They added one more day to the 2 they had already so it was a valid race for the trophy, with 3 out of 10 days. Winner; Alberto Sironi in the QUINTUS. Just 15 points ahead of Vittorio Squarciafico in the 15 m LS 8. 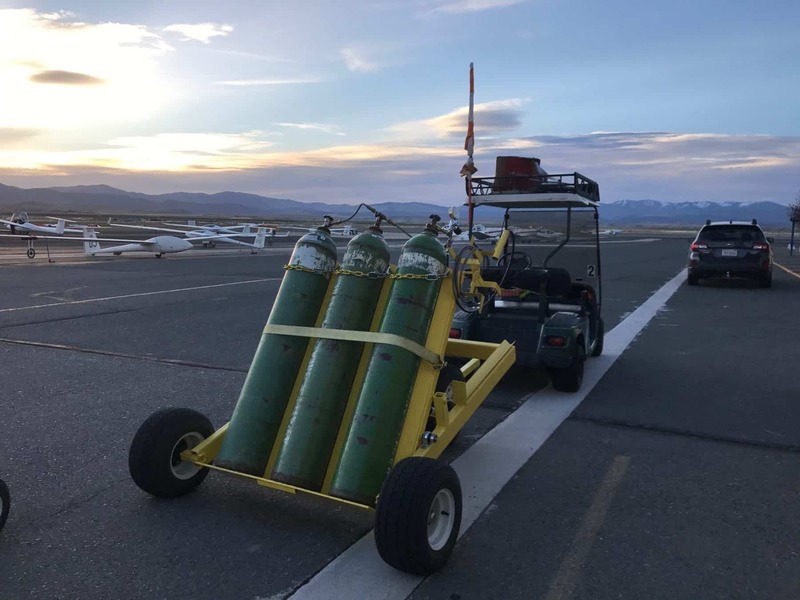 A total of 11 pilots in one handicapped class. 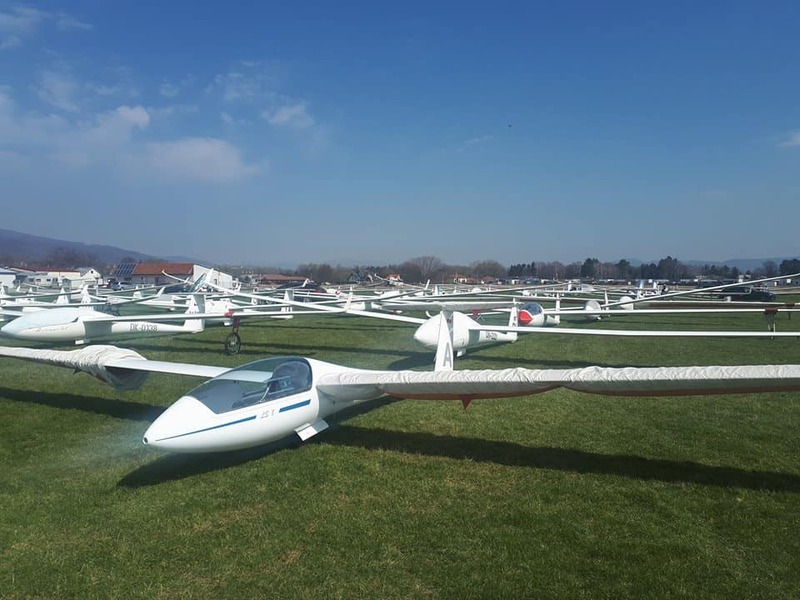 In Slovenia they started FCC Gliding 2018 just ONE week later and the weather is much better. 3 Classes Cub, 15 m and combi-class. 45 Pilots in club and UK pilot Tim Milner [ St Cirrus]won day 1 a 2.30 AAT. Tim worked for us as tuggie in the past , so did as you know Adam and he flies in Prividza as well in club with a St Cirrus. Adam was 11th . 27 Finished. Some pilots moved straight away from Nitra to Prievidza to enter this comps. Uwe Wahlig is one of them. He flies an LS 3 with winglets /15 m.
33 Pilots in 15 m. and Vladas Motuza from Poncuniai, was the best in this class in a Discus 2A. 19 Finished on this first day. 24 Pilots in the combi class including Sebastian Kawa and then you know it will be difficult to win. He straight set the standard with winning day 1. 4 Outlanded in this class on day 1. Day 2 yesterday was won by Uwe in club class. His “practice” in Nitra shows effect. Tim was 9th only loosing 46 points and Adam was 10th for the day.In this class flies a South African pilot as well; Sven Olivier in a St Cirrus , he was 5th for the day. 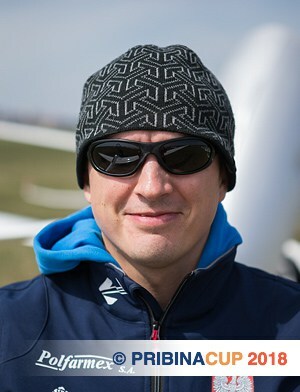 In 15 m. day 2 [2.30 AAT] was a prey for a Polish pilot with a great but difficult name flying an LS 8; Przemysław Bartczak. Quite a few “girls” in this class as Dana, Jana and Joanna. Combi-class,…questions…. ???? ?….NO ….Sebastian won in the JS1-CTJ 18 EVO. Kerrie Claffey, Allan Barnes, Harry Medlicott, and Ian Van Schalkwyk. Mac Ichikawa also set two Japanese records in Australia. ——–And to finish this great picture from Maria Szemplinska, [yes Jerzy’s wife] also one of my favorite photographers. A last picture about the FAI SGP in Orlando. 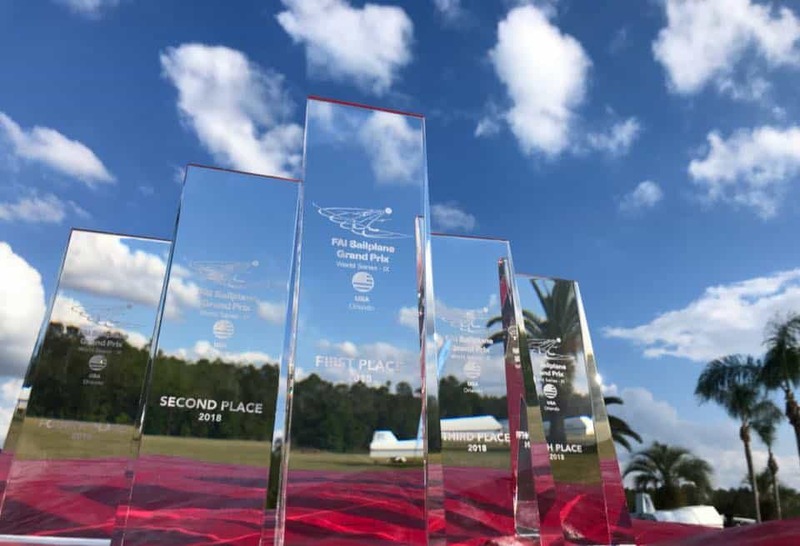 FAI Sailplane Grand Prix USA 2018 – Orlando, FL Great photo of Seminole-Lake Gliderport and FAI Sailplane Grand Prix USA 2018 – Orlando, FL with the beautiful Florida palm trees and the beautiful 18m sailplanes! And …because they are so beautiful, …. 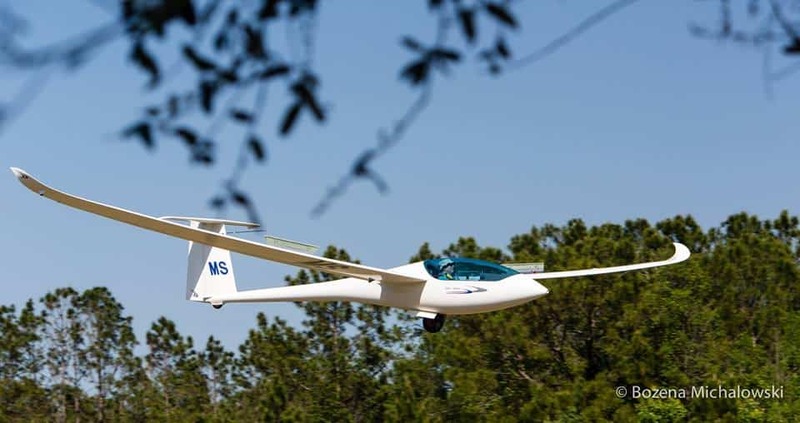 trees and gliders …one more , from another top photographer Bozena Michalowski who visited Orlando. Looking at those great palm trees,….we had last Sunday the hottest day ever with 22.3 at the meteo- station and up to 24 in my region. Orlando SGP over !Pribina Cup ..Nitra ! 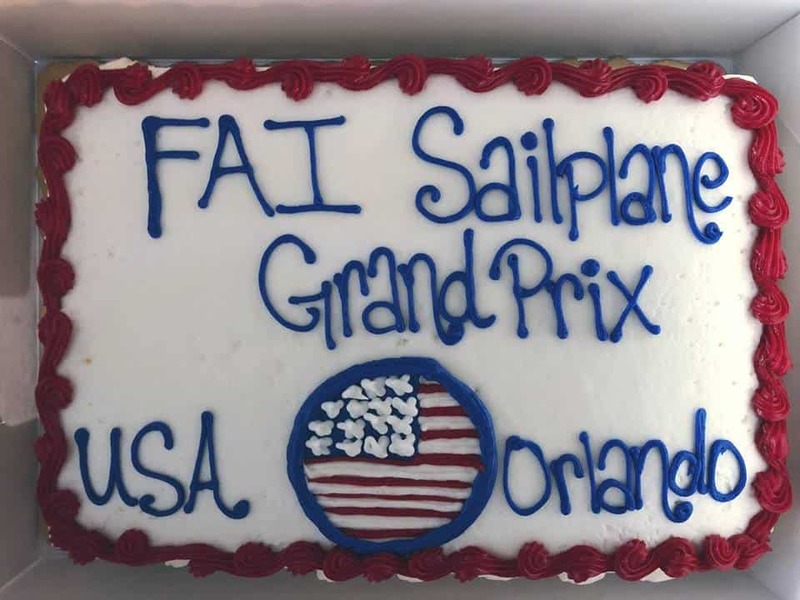 FAI Sailplane Grand Pix USA CAKE. Race 3; with 324 km. was a prey for Canadian pilot Sergei who won the 10 points.Again 6 pilots finishing in about the same time. Must be exciting to see for the spectators. Race 4;161 km. and Robin Clark in the ASG 29 flew ahead of another “3 pilot-bunch” and had a speed of 106 km./h. whilst the next 3 had 104 km./h. Another day cancelled and then……. Race 5 ; very last day and also the day of the prize giving at 7 PM. So the final race for the first prize was between the Canadian pilots Sergei and Jerzy. 242 km. was set and you see the weather “above”; the speed was 117 km./h. and the day was again ….3d time….for Sergei. And in the end there was still quite a difference between the 2; 42 and 31 points. With 29 points local “hero” Sean was 3d. 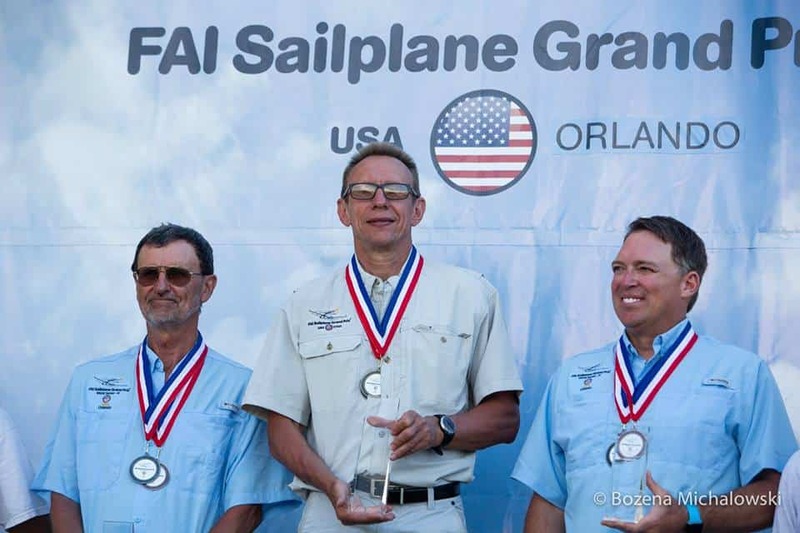 The ORLANDO FAI-SGP- TOPPERS !!!!! Picture by ELFO, every year I look forward to his fabulous pictures. Started on March 30 [Till April 7] with 91 competitors in 4 classes ; Club , 15 m., 2-seaters and open. 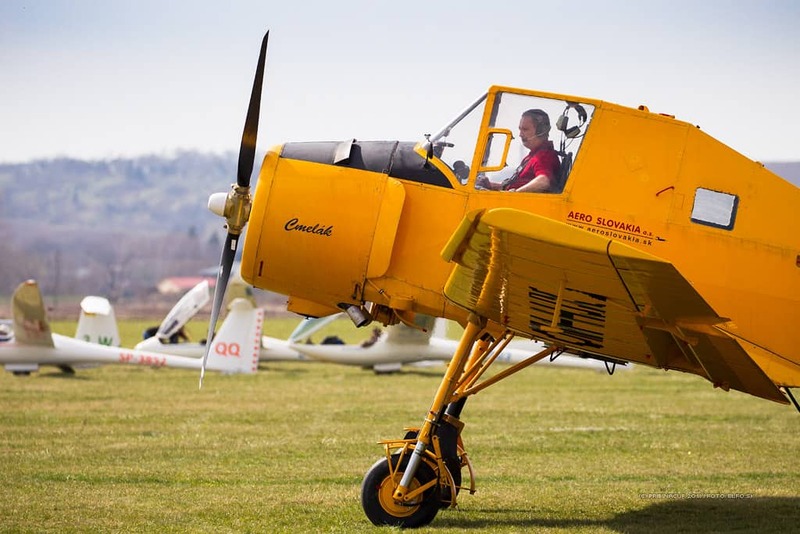 Place to be as every year, …Slovakia; the Nitra Airport. The max amount of participants is 50 in each class. Last April they mentioned that the PRIBINA CUP IS NOW AVAILABLE ON GOOGLE PLAY. With an early Easter time, you only can hope that the weather co-operates. The beginning showed a lot of rain but after 3 day’s the weather turned better . 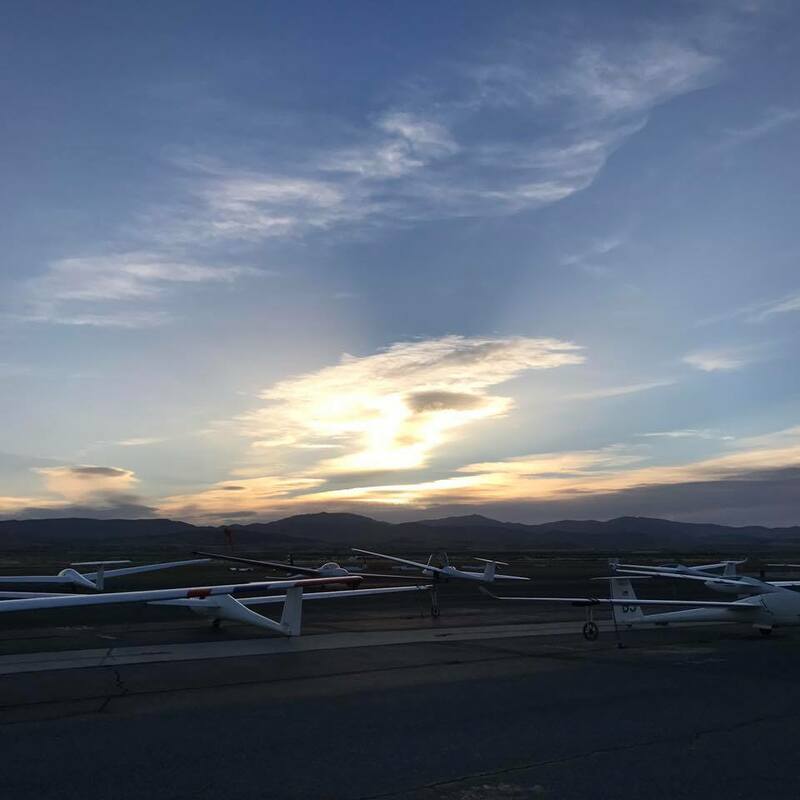 On Monday the competition-news was ; “The weather conditions are suitable for gliding today, the sky is clear, cumulus clouds with cloud bases of 2000m are expected with rises 2-3m/s. Wind is strong now, increasing with the altitude, but should slow down during the afternoon. Thermal activity should be dying out around 5pm. Therefore RACING TASKS for all classes with range from 250km for club class to 330 for open class. Where would we be without them ?? 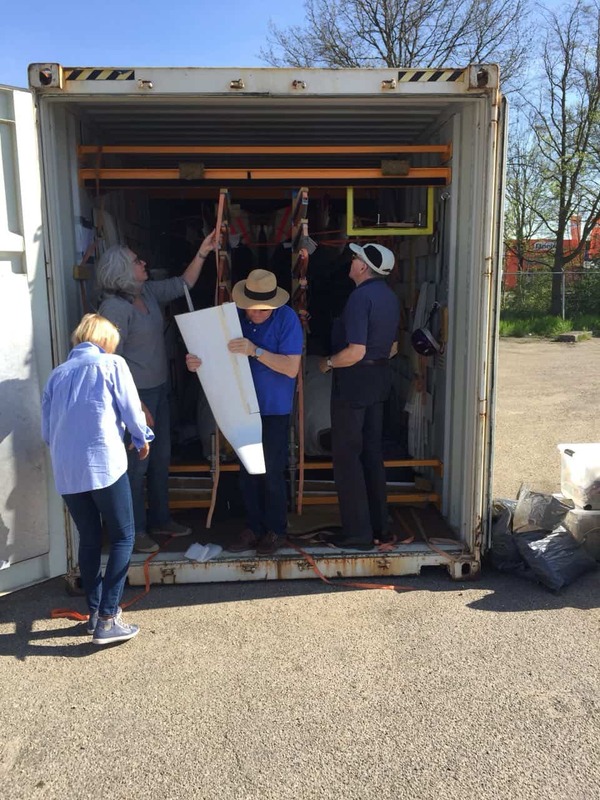 So task 1 was a fact ,but not for all as there were quite some out-landings. 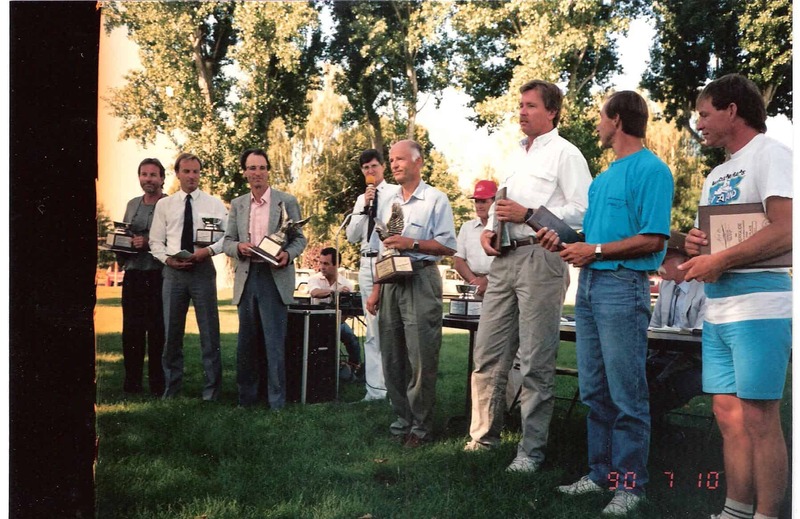 Club; 16 from 33 finished and German pilot Uwe Wahlig won in the LS 3….826 points. 15 m; 7 from 25 finished and 1000 points here for German pilot Jan Knischewski in the LS 8. 2-seaters; Only Wolfgang finished and the other 11 teams were out. 820 points for the ARCUS E.
Open; 4 from 18 finished and Bostjan …EB 28,…got the 987 daily points. AND,…till now that’s what happened. A pity ,but a bunch of great people together, will have a good time anyhow, though they are there for gliding. Still a couple of day’s to go and the weather should improve. Sofie from Belgium;…no worries just another competition. They started on March 30 as well with 10 competitors in one [handicapped] class. 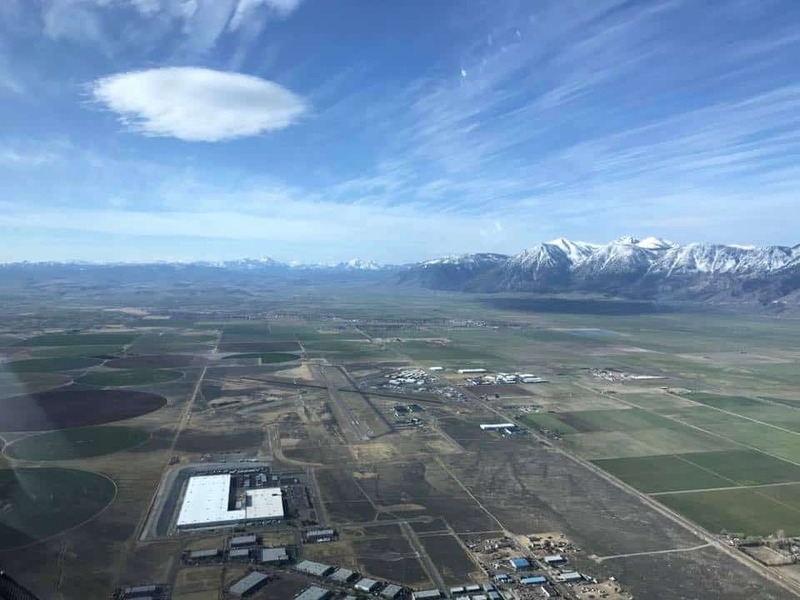 First flight at April 1 ,..NO …..no April-1-joke !!! Task for the pilots; 358 km. 7 finished and on handicap the LS 8/15 m. won from the ARCUS T whilst Alberto in the Quintus was 3d for the day. April 2 had a 2.15 AAT won by Alberto [261 km. in time 2.20] and ALL pilots finished. Next Friday they continue with the comps with after 2 days , Alberto as leader of the overall scores [1.647] before Vittorio in the LS 8 [[1.590] and team Grinza in the ARCUS T[1.582]. ——–Interesting!!!! Our Easter weather was COLDER than our Christmas weather!!!! !WEIRD !!!! But this weekend we have REAL spring with 20 dgr. C. I am going to truly enjoy that.